North American Vereine Form Friendships No records can be found to indicate that a Schuhplattler- or Trachtenveren existed in North America before 1914 when Schuhplattler-Verein Edelweiß of Chicago, Illinois, was founded. This Verein, which still exists today, is one of the charter members of the Gauverband Nordamerika. However, between then and World War II, other Vereine formed and nineteen of these are members of the Gauverband. Before the 1950s, communication amoung Vereine that were far from one another was practically nonexistent. But as travel means improved, so too did contact among Vereine. Many were celebrating Fahnenweihen or reaching milestones such as twenty-fifth or more anniversaries; these were reasons for getting together. New Schuhplattler- and Trachtenvereine were forming, and participation at Trachtenfeste was increasing rapidly. Each Fest, however, had problems with the Trachtenschau and especially with Preisplatteln. Some of these problems stemmed from the differences in dance style from one region of the country to another, making judging difficult. People were also growing more concerned about the scheduling of these Feste and saw a need to form an official federation. Although it was a prime topic at several Trachtenfest, nothing concrete developed until 1965. The Call to Unite, 1965 Not until BGTEV D'Holzhacker Buam's 30. Stiftungfest with International Trachtenfest in Milwuakee in July 1965 did Vereine take seriously the need for a Gauverband, a federation that would insure closer bonds. That weekend, Washingtonia's Rudy Poelsterl made an urgent plea to the twenty Vereine present to meet the morning of Sunday, July 4, to address this idea. The Vereine's representatives met at the Old Heidelberg Inn before the host Verein's Sunday activities. They agreed to send representatives to Milwaukee on January 15-16, 1966, to formulate rules for governing the federation and to set up preisplatteln guidelines. This was the vote of confidence and dedication needed to prod the Vereine into working toward a common goal. D'Holzhacker Buam Milwaukee agreed to arrange the meeting and to contact all known Vereine. On October 10, 1965, Rudy Unger, Vorplattler of D'Holzhacker Buam, sent a letter to about thirty Vereine regarding the commitment to form a Gauverband in North America and invited them to the meeting. The attendance of twenty presidents or representatives the following January was an overwhelming response. First Official Meeting, 1966 On that historic day, January 15, 1966, at about 4:20 p.m., twenty delegates met at the Old Heidelberg Inn, Milwaukee and unanimously agreed to form a North American Gauverband. The delegates represented: BGTEV D'Holzhacker Buam, Milwaukee, Wisconsin; SVEV D'Oberlandler, Milwaukee, Wisconsin; BGTV D'Lustig'n Wendlstoana, Milwaukee, Wisconsin; BGTV D'Lustigen Holzhacker Buam, Chicago, Illinois; Drei Trachtenvereine of Milwaukee; SV Edelweiß, Chicago, Illinois; SGTV Edelweiß, Buffalo, New York; GTEV Edelweiß, Detroit, Michigan; BGTEV D'Werdenfelser Stamm, Sheboygan, Wisconsin; TEV Edelweiß, Denver, Colorado; Edelweiß-Passaic, Passaic, New Jersey; Bayern Verein, Newark, New Jersey; Blaue Donau (now STV Bavaria), Cleveland, Ohio; GTV Almrausch, Philadelphia, Pennsylvania; Die Gemütlichen Enzianer, Maspeth, New York; GTEV Schlierachteler Stamm, New York, New York; SVV Original Enzian, Glendale, New York; Vereingte Bayern von Groß New York u. New Jersey; Schuhplattlergruppe Alpenland, Montreal, Quebec; SGTV Washingtonia, Washington, D.C.
Rudy Unger chaired the meeting. The representatives agreed to draft bylaws and preisplatteln rules and to elect intereim officers. Two committees were set up to undertake the work - one to draft the bylaws, the other to set the rules for Preisplatteln. The committees had difficult talks. Late that night, the exhausted delegates recessed but reconvened early the next morning to complete the work. The bylaws and preisplatteln rules drafted that weekend would be sent to the Vereine for approval or amendment. Our formal name was chosen: Gauverband Nordamerika, a name that encompasses Vereine in Canada and the United States and leaves open the possibility of extending membership to Mexico. The confidence and trust the representatives had in one another created a solid foundation for this new federation. Interim Executive Board: Now came the task of electing an interim board to lead the Gauverband in the months ahead. The preliminary bylaws stipulated that the board consist of an 1. and 2. Vorstand, Schriftführer (secretary), Kassierer (treasurer), Vorplattler, Archivar (historian), four Revisoren (trustees), and four Beisitzer (directors). The results of the late Sunday afternoon elections: 1.Vorstand: Rudy Poelsterl, Washingtonia, Washington, D.C.; 2.Vorstand: Albert Richter, Bayern Verein, Newark; Schriftführer: Rudy Unger, D'Holzhacker Buam Milwaukee; Kassierer: Walter Wieand, Edelweiß, Buffalo; 1.Vorplattler: Robert Christie, Edelweiß-Passaic; Archivar: Dave Rosenberg, Washingtonia, Washington, D.C. Revisoren: Kenneth Ruff, Schlierachtaler Stamm New York; William Kessler, D'Werdenfelser Sheboygan; John Kennedy, D'Holzhacker Buam Milwaukee; Tom Scheibl, Edelweiß Chicago. Beisitzer: Herbert Massel, Vereingte Bayern; Hans Schupp, Alpenland, Montreal; George Vogel, D'Holzhacker Buam Milwaukee; Kennth Roberts, Almrausch Philadelphia. The delegates assessed each Verein $25 for operating expenses; this fee was not an initiation fee or dues. The delegates wanted the Gauverband to be effective and unhampered by funding shortages. Since they could not determine how much money would be needed for initial tasks, deciding a dues structure was left for a later date. At the meeting Herb Massel, Vereinigte Bayern, described plans for a Trachtenfest in Newark, New Jersey, on May 27-29, 1967. Now that the Gauverband was no longer just a dream, this Fest would be the 1.Gaufest of the Gauverband Nordamerika. To add to the excitement, the Freistaat Bayern was donating a preisplatteln Wanderpreis to the Gauverband. The weekend meeting ended, and the participants returned home enthusiastic about the successful birth of the Gauverband Nordamerika. Montreal, 1966 The Gauvorstand called an executive board meeting for July 2, 1966, in Montreal before the Alpenland's Fahnenweihe. The board would attempt to adopt the bylaws and presiplatteln rules which the Vereine had reviewed. No one realized then that changes would be an ongoing task to improve the effectiveness of the Gauverband and the quality of judging. The agenda was so long that the meeting would have infringed on the Fahnenweihe. Therefore, only items concerning Preisplatteln were acted on to give the Vereine additional guidance for the upcoming Gaufest. Weitpreis: Alpenland's Fahne was blessed on Saturday at the Slovak Hall. At Saturday evening's celebration, Lufthansa German Airlines donated to the Gauverband a silver trophy, procured throught the efforts of Ann Bauer, president of Alpenland Montreal. This Wander pokal, named "Weitpreis" was to be presented at Gaufeste to the Verein that had traveled farthest. To start the Weitpreis into circulation, D'Holzhacker buam Milwaukee was the first Verein to receive it and kept the trophy until the Gaufest in Newark. This gift was another recognition the Gauverband recieved from the government and private enterprise. On Sunday the festivities included a Trachtenparade and Fahnenweihe at both St. John's Lutheran Church and St. Boniface Roman Catholic Church. Preise were awarded for Saturday evening's Trachtenschau. Temperatures that weekend exceeded 100°F; fortunately, the majority of the festivities were indoors. The Fahnenweihe was a beautiful celebration which everyone attending remembers. Executive Board Meeting, Newark, 1966 The Gauverband was establishing itself as a working organization, and member Vereine were interested in its operation. 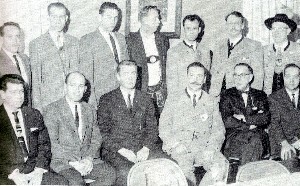 The Vereinigte Bayern arranged an executive board meeting on September 10 and 11, 1966, in Newark at the Robert Treat Hotel. The board had the opportunity to survey the facilities for the 1. Gaufest, which would be held there in less than a year. The agenda included adopting amendments to the bylaws and preisplatteln rules; adopting guidelines for hosting a Gaufest and maintaining the two Wanderpreise; and incorporating. The board accorded charter membership to the sixteen Vereine represented in Milwaukee in January 1966. Of the Vereine that attended that meeting, Holzhacker Buam Chicago did not join the Gauverband until 1971; Bavaria Cleveland separated on good terms from its parent group Blaue Donau and joined the Gauverband in 1967; and the two umbrella organizations were not eligible to join. Charter membership was also eventually extended to the Vereine that joined the Gauverband in 1967. In 1986 Charter Certificates were distributed to these twenty-seven Vereine during the twentieth anniversary banquet at the delegates meeting in Buffalo. Wanderpreis: Albert Richter, 2. Gauvorstand, announced that the preisplatteln Wanderpreis would be on hand at the 1. Gaufest in Newark. This trophy is a hand-carved wooded statue from Oberammergau, Bayern. It was donated to the Gauverband through Albert's efforts as well as those of Franz Leidmann of München; Dr. Fritz Baer, Ministerialdirektor; and Freiherr von Brand, Ministerialdirektor of the Bavarian government. The Bavarian government, under Bayerischer Ministerpräsident Dr. Alfons Goppel, donated the trophy.The board decided to draw up incorporation papers under the name "Gauverband Nordamerika." Gauvorstand Rudy Poelsterl advised that he would have the Gauverband incorporated in Washington, D.C., through a law firm there. Incorporating would take some time but, once approved (finalized on April 10, 1970), it would require only periodic renewal. When the officers completed their work, Bayern Verein Newark invited them to an Oktoberfest at Farcher's Grove. There they met Trachtler from D'Roaga Buam of Ismaning-München, and everyone got acquainted and exchanged ideas. The groundwork for establishing the Gauverband Nordamerika was complete. 1. Gaufest, Newark, 1967 The 1. Gaufest in 1967 was the first test of preisplatteln rules and established a format for future Gaufeste. The Vereine's response that Memorial Day weekend was tremendous; about 1200 people attended the Fest. Trachtler and Trachtlerinnen from all over the United States and Canada filled the banquet hall. Preisplatteln was held after Saturday evening's banquet and was divided into two parts to provide an intermission. The judges for this competition came from within the Vereinigte Bayern, thus permitting its member Vereine to compete. Nineteen Vereine took part in Preisplatteln. The judges' task was not an easy one, and they worked into the early hours of Sunday morning compiling the scores. While the judges deliberated, the program continued with guest speakers and dancing. On Sunday the Trachtler and Trachtlerinnen began the beautiful day with a Trachtenzug at the Schuetzen Park, Bergen, New Jersey. Anticipation built during the afternoon as everyone wondered who would win the Preise. The Weitpreis went to Edelweiß Denver; the Meistpreis to Edelweiß Buffalo. Fahnenbänder were presented to the participating Vereine, followed at last by the three preisplatteln awards. Gauvorstand Rudy Poelsterl and 2. Gauvorstand Albert Richter had the honor of presenting the Wanderpreis to the first place group. The recipients of the Preise for the 1. Gaufest were: 3. Preis: SG Alpenland Montreal, 2. Preis: Bayern Verein Newark, 1. Preis: Edelweiß-Passaic. The recipients were overjoyed with their Preise. A new era was beginning; the Preise became incentives for all the Vereine. Delegates Meeting 1967: For many Trachtler and Trachtlerinnen, Monday meant sightseeing in and around New York City. For the Gauverband officers and delegates, however, Monday meant a delegates meeting at the Robert Treat Hotel to discuss, among other things, many preisplatteln rules and bylaws amendments. Edelweiß Denver invited the Vereine to participate in the 2. Gaufest on July 4 through 6, 1969, in Denver. Edelweiß Detroit received approval to host the 3. Gaufest in 1971 in conjunction with its fortieth anniversary. After adjournment, the delegates joined the other Trachtler and Trachtlerinnen in the Yorkville section of Manhattan. The evening's program included a parade of flags, music, and a Massenplattler on 86th Street. When the crowd on 86th Street thinned out very late, it signified that the first Gaufest was over. Buffalo, 1968 Many Trachtler and Trachtlerinnen were already looking forward to the next Gaufest. Meanwhile, the board members worked to make the Gauverband an effective federation. On July 4, 1968, before Edelweiß Buffalo's Fahnenweihe, the executive board met again and gave final approval to the bylaws and preisplatteln rules that would then be mailed to all member Vereine. Herb Massel, Vereinigte Bayern, reviewed the 1. Gaufest. He gave the written report, along with the participating groups' comments, to Edelweiß Denver to use in planning the 2. Gaufest. The officers stressed the need for Edelweiß Denver and future Gaufest hosts to adhere to the bylaws and the preisplatteln rules. The Gauverband notified Holzhackerbuam Toledo that its planned Preisplatteln outside of a Gaufest was not sanctioned by the Gauverband. The member Vereine's cooperation established the Gauverband as the governing body for future Gaufeste. The officers wrote guidelines for membership, dues assessment, and a proposal to create a Gauverband pin. Rudy Poelsterl and Dave Rosenberg consented to design a Gauverband pin for members; the Gauverbände in Germany use pins to identify membership in a Gauverband. Rudy said that he would be traveling to Germany in the fall and wanted to present a gift to Dr. h.c. Alfons Goppel, bayerischer Ministerpräsident, in appreciation of his interest in and generosity to the Gauverband. The preisplatteln Wanderpreis had been donated to the Gauverband under the Ministerpräsident's jurisdiction. The officers concurred, and Dave designed an appropriate gift which Rudy presented to Dr. Goppel. After the meeting, the officers participated in Edelweiß Buffalo's Fahnenweihe. The formal blessing of the flag was Saturday evening at Villa Maria Convent Chapel. After church services, the Trachtler and Trachtlerinnen paraded across the street to Rescue Hose Hall. Eight hundred people enjoyed the casual program that followed. Sunday, July 6, was a beautiful day for exchanging Fahnenbänder, performing more Ehrentänze, and enjoying plenty of good music and food at Spring Garden Park. 2. Gaufest, Denver, 1969 The 2. Gaufest in Denver seemed a long time off after Edelweiß Buffalo's Fahnenweihe. Most Vereine planned vacations with their trips, and many people flew in a few days before the Gaufest to adjust to the altitude in the "Mile High City." The background scenery reflected the true spirit of our culture, "herrlich" (heavenly). Gaufest headquarters was the downtown Hilton Hotel. A welcoming party was held on Friday, July 4, 1969, at Edelweiß's Vereinsheim not far from the hotel. Although presidents and Vorplattler attended a meeting on Saturday, other people had most of the day free for sightseeing. At the meeting, the representatives reviewed preisplatteln rules and selected the dance order for their groups. A banquet for children was held in the early afternoon. Preisplatteln, Ehrentänze, and open dancing took place after the main banquet in the Grand Ballroom. The Sunday activities at Adams County Fairgrounds were in a huge circular pavilion which was filled to capacity. After non-denominational church services, the program started with a Trachtenzug and a Massenplattler of the "Gauplattler." The weather was extremely hot, and everyone anxiously awaited the Preise. The host Verein relinquished the Weitpreis that it had won at the previous Gaufest and presented it to Alpenland Montreal. The highlight of the afternoon was the awarding of Preise for Preisplatteln. Sixteen Vereine had competed, and each Verein was hoping its name would be called. Preise were awarded as follows: 3. Preis: D'Werdenfelser Sheboygan, 2. Preis: Edelweiß-Passaic, 1. Preis: Bayern Verein Newark. Each Verein performed the dance that it had performed in the competition; the dancers' joy was obvious. More dancing followed the awards presentation. After the fairgrounds closed, several parties at the hotel lasted into the early morning. The delegates meetings were scheduled in conjunction with the Gaufest to economize on traveling costs. Contrary to intentions, meeting attendance had not increased. In fact, attendance dwindled throughout the afternoon until only half of the delegates remained. Although the meeting was successful as far as accomplishing the agenda items, overall participation was not forthcoming. The officers and many delegates were concerned about this; something had to be done. Since several officers would be in Milwaukee on July 4 and 5, 1970, for D'Oberlandler's Fahnenweihe, a board meeting was called for that weekend. D'Oberlandler was asked to make the necessary arrangements. The new officers elected at this meeting were 1. Gauvorplattler, Max Winklhofer; 2. Gauvorplattler, Hans Schupp; Schriftführer, Ken Roberts; Beisitzer, Erv Scheller, John Schaefer, and Reinhold Rock; and Revisoren, Earl Johnson, Robert Christie, and Sid Heyman. Before the meeting adjourned, the delegates congratulated Edelweiß Denver on a successful 2. Gaufest and thanked the host Verein for the hospitality its members had extended. Thus ended the 2. Gaufest and delegates meeting. Executive Board Meeting, Milwaukee, 1970 The board meeting in July 1970 was at the Eagles Club in Milwaukee. The officers took steps to schedule a delegates meeting on a weekend that would not conflict with other activities within the Gauverband. They also developed a meeting format to encompass officer reports, committee meetings, and other panels in an effort to expedite Gauverband business. Because problems affecting the Gauverband's well-being were evident, the board recommended calling a special delegates meeting before the next Gaufest. Bavaria Cleveland and the Clevelander Schuhplattler volunteered to cohost the special delegates meeting. Cleveland's central location minimized travel for the delegates. A tentative date of January 16 and 17, 1971, was set. Joe Stano of Edelweiß Detroit gave a summary of the activities planned for the 3. Gaufest on the July 4, 1971, weekend. Edelweiß Denver gave Edelweiß Detroit the synopsis of comments from the previous Gaufest to review and consider. Gauvorstand Rudy Poelsterl reported that the Gauverband Nordamerika's incorporation was official as of April 10, 1970. Music scores for the "Gauplattler" and "Gaumarsch" were presented to the Gauverband. Rudy Poelsterl began work to have the music copyrighted for the Gauverband. This music would be made available to member Vereine. The "Gaumarsch" is scored for several musical instruments so that it can be used by bands. It was suggested that the "Gaumarsch" be played at every Gaufest. Rudy Poelsterl also presented two Gauverband member pin designs; one a small lapel pin priced at 1.90 DM, the other a larger pin with fringe for 5.40 DM. The larger was selected as the official pin, and the GauKassier assumed responsibility for ordering and selling the pins. Hans Schupp, 2. Gauvorplattler, notified the board that he had moved to Vancouver, British Columbia, and could not complete his term of office. Al Goetz from D'Werdenfelser Sheboygan was appointed for the duration of the term. Action on several preisplatteln rule changes was deferred to the special delegates meeting. Everyone at the board meeting agreed that separating the delegates meetings and the Gaufest would relieve much pressure; the officers looked forward to the delegates meeting in Cleveland. The board adjourned to enjoy D'Oberlandler's festivities. D'Oberlandler Milwaukee's Fahnenweihe: The Trachtler, Trachtlerinnen, and other guests were bused from mid-town Milwaukee motels to the church in Glendale. Festivities began with the flag blessing at Holy Family Roman Catholic Church, followed by a procession of flags, Trachtler, and Trachtlerinnen. The oval Eagle Ballroom with its perimeter balcony was a beautiful setting for the banquet, Ehrentänze, and general dancing that rounded out the evening. The Sunday festivities at Old Heidelberg Park in Glendale (the site of the newly built Bavarian Inn) started with a parade and presentation of Erinnerungsbänder (remembrance banners). The Vereine performed more Ehrentänze. As the day ended, the guests left, some returning to the motels which were still bustling with activity. The delegates were pleased with the meeting results; their determination to make the Gauverband a strong federation had kept them working for many hours. All felt that this meeting was a good omen for the Gauverband. The delegates returned home to report the meeting outcome to their memberships. 3. Gaufest, Detroit, July 1971 When the 3. Gaufest weekend arrived, a mass of Trachtler and Trachtlerinnen converged on the Detroit Hilton Hotel. The weekend began on Friday with a welcoming party at the German-American Cultural Center. Saturday began with meetings for the Vorplattler and presidents to establish preisplatteln order and to review the weekend program. Eighteen Vereine participated in Preisplatteln on Saturday afternoon in the Hilton Hotel Ballroom. This schedule change, approved at the 1971 delegates meeting in Cleveland, eliminated competition pressure from the banquet. In turn, it opened the evening to more music, dancing, and socializing. The banquet was at Cobo Hall, and the evening's program included the parade of flags, the "Gauplattler," and Ehrentänze. Arrangements had been made with the hotel for an after-hours get-together in the ballroom to give everyone more time for dancing and socializing. The Sunday activities were at the Light Guard Armory and included a parade of flags and presentation of Fahnenbänder. The Stroh Brewery of Detroit donated a Friendship Award that was added to the trophies to be awarded at a Gaufest. The participating Vereine selected the recipient by ballot---Edelweiß Detroit received the award. Edelweiß Denver received the Weitpreis award. Preisplatteln awards went to: 3. Preis: Bavaria Cleveland, 2. Preis: Bayern Verein Newark, 1. Preis: D'Werdenfelser Sheboygan. As had become tradition, each Verein performed its winning Plattler. More Ehrentänze and socializing followed; the music and dancing lasted into the late evening at the Armory, then moved to the hotel. Late Saturday evening the nominations committee held elections. The offices that changed hands were 1. Gauvorplattler, Al Goetz; 2. Gauvorplattler, Rudi Hermes; Beisitzer, Joe Stano and Paul Ulrich; and Revisoren, George Lindner, Joe Klingseisen, and Max Winklhofer. The final agenda item was selecting a site for the next delegates meeting. The two Cleveland Vereine and D'Lustig'n Wendlstoana Milwaukee offered to host it in 1974; the delegates selected Milwaukee. Bavaria Cleveland and D'Werdenfelser Sheboygan invited all the Vereine to their Fahnenweihen on the Memorial Day and Fourth of July weekends respectively. The meeting's business was over, and the delegates braved the cold for home. Celebrations, 1972 The year 1972 was busy for all the Vereine, especially for Original Enzian Glendale, Bavaria Cleveland, and D'Werdenfelser Sheboygan each of which celebrated something special. Original Enzian Glendale celebrated its fiftieth anniversary on April 22 with festivities at the Plattdeutscher Park, Franklin Square, Long Island. Bavaria Cleveland had its Fahnenweihe on May 26 through 28 at the Sheraton-Cleveland Hotel with the flag blessing at St. John's Cathedral. D'Werdenfelser Sheboygan held its Fahnenweihe on July 1 and 2. The flag blessing ceremony was at St. Mary's Roman Catholic Church with a banquet later that day. A picnic at River View Park on Sunday concluded the event. 4. Gaufest, Washington, D.C., 1973 The Vereine looked forward to the 4. Gaufest in Washington, D.C. The city offered excellent sights, and many of the Trachtler and Trachtlerinnen took advantage of tours. Slides taken at previous Gaufeste were shown in the hotel lobby, and a welcoming reception was held in the hotel hospitality rooms. Music played and free beer was served throughout the evening. Preisplatteln was on Saturday afternoon in the International Ballroom; twenty-four Vereine competed during two and one-half hours. A dignitaries reception was held for the Gauverband officers and invited guests from Washington, D.C., and Germany. One of the distinguished guests was Dr. Hans Eisenmann, Landwirtschaftsminister, representing Dr. Alfons Goppel, Ministerpräsident of Bavaria. Gau Flag: Trachtler, Trachtlerinnen, and friends filled the oval International Ballroom to capacity. Following the banquet, Dr. Eisenmann presented a beautifully embroidered flag to 1. Gauvorstand Rudy Poelsterl. The flag design incorporated the Gauverband symbol and the shields of the United States, Canada, and Bavaria, signifying unity among the governments. Dr. Eisenmann spoke enthusiastically about the Gauverband and emphasized the need to continue promoting Bavarian culture in North America. Gifts from Dr. Goppel were also presented specifically to Rudy Poelsterl and Walter Wieand, 2. Gauvorstand, for all their time and efforts to the Gauverband. After Dr. Eisenmann's presentation and speech, the flag was attached to the pole, blessed, and paraded through the banquet hall for all to see. The flag has since been known as the "Gau Flag" and has been at every Gaufest, Fahnenweihe, and special anniversary celebration in the United States and Canada. Heavy rain on Sunday forced the festivities to move from the Georgetown University campus grounds to the gymnasium. Edelweiß Denver again received the Weitpreis. Preisplatteln awards were presented to: 3. Preis: Die Gemuetlichen Enzianer Maspeth, 2. Preis: D'Werdenfelser Sheboygan, 1. Preis: Bavaria Cleveland. The hospitality rooms at the hotel were popular as participants wound down from an eventful weekend. The delegates accepted D'Lustig'n Wendlstoana Milwaukee's request to host the Gaufest in 1977. The office of Gauverband Bibliothekar (librarian) was suggested to collect music, Schuhplattler, Trachtentänze (historical and figure dances), etc., and make these available to member Vereine. Election of a Bibliothekar would take place at the 1976 delegates meeting. Many Vereine had dreamed of having a workshop to teach Schuhplattler and Trachtentänze. The preisplatteln committee recommended that a workshop be conducted at our meetings if time permits. Although an effort was made to shorten the committee meetings, no time was available for a workshop. Erich Bayer chaired the nominations committee. With Rudy Poelsterl's retirement as 1. Gauvorstand, several changes took place on the executive board. The delegates elected Walter Wieand, Edelweiß Buffalo, as Rudy Poelsterl's successor. Others elected: John Schaefer, D'Oberlandler Milwaukee, 2. Gauvorstand; Joe Klingseisen, D'Wendlstoana Milwaukee, Schriftführer; and Lloyd Wevang, Holzhacker Buam Chicago, Archivar. Since Rudy Poelsterl had said that he would not "disappear," the delegates elected him, along with Walter Kraft, Bayern Verein Newark, as two of the four Revisoren. The incumbents for Kassier, 1. and 2. Gauvorplattler, Beisitzer, and the other two Revisoren were reelected. The meeting resumed with the new officers carrying out the remaining business. Three Vereine---Edelweiß Buffalo, Clevelander Schuhplattler, and D'Oberlandler Milwaukee---offered to host the 1976 delegates meeting. Buffalo's invitation for the January 10 and 11, 1976, meeting was accepted by secret ballot. On the recommendation of the Beisitzer, Alpenland Hamilton was reinstated with full membership rights. Heinz Hirschmann, president of Alpenland, thanked the delegates and expressed his gratitude for the fairness and consideration extended to his Verein. The delegates welcomed adjournment after the long hours of meetings. The lunch and supper breaks had allowed for little interaction among delegates, but everyone knew the time was well spent on necessary work. Celebrations, 1974 Nineteen seventy-four was another year for celebrating special anniversaries. Edelweiß Reading celebrated its twenty-fifth anniversary on May 25 and 26 with a banquet at the Hotel Abraham Lincoln, a Bauernmesse at St. Paul's Roman Catholic Church, and an indoor picnic at the Reading Liederkranz. D'Holzhacker Buam Chicago celebrated its Golden Jubilee on June 7 through 16 at the Schwaben Center in Buffalo Grove, Illinois; the guests included D'Linzer Buam from Linz, Austria. Edelweiß Chicago celebrated its sixtieth anniversary and Fahnenweihe on August 30 and September 1. The festivities included the flag blessing at Mary Seat of Wisdom Roman Catholic Church, a banquet at the Sheraton Hotel, and a picnic at the Northbrook Picnic Grove. 5. Gaufest, Montreal, 1975 The summer months of 1974 were over, and the next Gauverband event would be the 5. Gaufest in Montreal, Quebec, in July 1975. Montreal is the largest bilingual city in North America and a beautiful tourist attraction. Alpenland Montreal had been working for many months to make its Gaufest a special event. Controversy erupted when the Vereine received their initial Gaufest correspondence. The reaction was that the Queen Elizabeth Hotel in downtown Montreal was too costly---the rash of complaints was overwhelming. Vereine threatened to boycott the Gaufest, and some did just that. Although Alpenland continued to meet with the hotel management, only small price concessions were given even after months of negotiation, and the cost was still higher than most wanted to pay. As the time drew near, however, the furor diminished. On July 4, hundreds of Trachtler and Trachtlerinnen assembled at the beautiful Queen Elizabeth Hotel, one of the finest hotels in Montreal. The Friday and Saturday activities were in the hotel starting with a welcoming dance Friday evening in Le Grand Salon. At a special delegates meeting that morning, the four preisplatteln amendments first discussed at the 1974 general meeting were adopted and took immediate effect. Twenty-four Vereine participated in Preisplatteln that afternoon in Le Grand Salon. That evening, Trachtler, Trachtlerinnen, and friends would fill the same room to enjoy a wonderful banquet. Alpenland and visiting Vereine performed Ehrentänze. The Alt-Münchner Volkstanz Verein from München was present, and its members performed several traditional Volkstänze. The Sunday festivities were on the Concordia University-Loyola College campus. The day was beautiful but extremely hot, and shade trees were scarce. The ceremonies opened with the parade of flags and presentation of Fahnenbänder. The highlight of the afternoon was the awarding of Preise. D'Oberlandler Los Angeles received the Weitpreis. Preisplatteln awards went to: 3. Preis: Bayern Verein Newark, 2. Preis: D'Werdenfelser Sheboygan, 1. Preis: Bavaria Cleveland. The afternoon continued with performances by the visiting Vereine. Slowly the crowds in the campus area thinned out. Despite the initial tumult, the 5. Gaufest in Montreal is now on record as a very successful event. Hans Bauer of Alpenland Montreal reported on the 5. Gaufest. The members of Alpenland were very pleased with the Gaufest and felt that their goals of maintaining the highest standards and practicing the traditions and customs of the Gauverband had been achieved. Joe Klingseisen, Wendlstoana Milwaukee, reported on the upcoming 6. Gaufest in 1977. The Gaufest committee had selected the Red Carpet Inn as Gaufest headquarters and Old Heidelberg Park for the picnic. Two sites were under consideration for the 7. Gaufest in 1979: Buffalo, New York, and Los Angeles, California. Both Vereine made their presentations. A secret ballot vote gave Los Angeles the nod. The delegates recommended that a dance workshop be conducted at future Gaufeste and that the host Verein make space available to the two Gauvorplattler to hold the workshop. Changes to the executive board were few this year: Schriftführer, Walter Kraft; 1. Gauvorplattler, Rudi Hermes; 2. Gauvorplattler, Erich Bayer; and Revisor, Erech Morrison. Enzian Volkstanzgruppe Delaware, D'Minnesota Schuhplattler St. Paul, and Holzhackerbuam Toledo extended invitations to the 1978 delegates meeting. After due consideration, Newark, Delaware was selected. Another lengthy meeting came to a close. Saturday night's heavy snowfall hampered travel and caused air travel delays; however, all the delegates were able to leave by late evening. Celebrations, 1976 Another successful delegates meeting was behind us. Almrausch Philadelphia was preparing for its Fahnenweihe and fiftieth anniversary celebration on July 3 and 4, 1976. The year 1976 was the bicentennial year for the United States, and Philadelphia was the center of the celebration. Scheduling the Fahnenweihe for that weekend gave people the added opportunity to enjoy the bicentennial festivities. Lodging was at the Bellevue Stratford Hotel which bustled with Secret Service personnel because President Gerald Ford was in town for the bicentennial gala. Security was tight, and the Trachtler were warned that one part of their Tracht---namely, their knives---should not be brought along. The Fahnenweihe started on Saturday afternoon with the flag blessing and benediction at the Cathedral of Sts. Peter and Paul and a parade to the hotel. The banquet was in the hotel ballroom. The evening's activities included a parade of flags and Ehrentänze. The Sunday program was at the Cannstatter Volksfest Verein Picnic Grounds where a parade of flags, the presentation of Fahnenbänder, and Ehrentänze took place until stormy weather cut short the celebration. Executive Board Meeting, Newark, 1977 The executive board's highest priority was to keep the Gauverband active and maintain communications with member Vereine. To achieve this, the officers felt they needed to work together between the delegates meetings and Gaufeste and decided to have executive sessions. The first would be in January 1977, several months before the 6. Gaufest. Paul Ulrich, Bayern Verein Newark, invited the board to Newark, and the meeting was at the Vereinslokal, Farchers Grove and Restaurant, on January 15 and 16, 1977. Bayern Verein lodged the officers in private homes, and the Verein members extended excellent hospitality. This was the first officers-only meeting since September 1966. Previous board meetings were open to delegates; and outside input, although discouraged, could not be avoided. A closed session gave the officers more freedom to speak and act on Gauverband business. The agenda for this meeting was lengthy, so the meeting lasted late into Saturday evening. On Sunday a short meeting was held to complete business. The meeting proved to the officers that there was, indeed, a need for regular board meetings. This weekend was also an opportunity for the officers to get to know each other personally. The minutes sent to the Gauverband members confirmed that the board had had a productive meeting, and a preliminary report about the 6. Gaufest allowed member Vereine to plan for the event. 6. Gaufest, Milwaukee, 1977 Nineteen seventy-seven was the golden anniversary year for D'Lustig'n Wendlstoana Milwaukee, and plans for the 6. Gaufest were well underway for the weekend of July 1 through 3, 1977. Gaufest headquarters was the Red Carpet Inn, a motel complex with an exposition hall where Friday's and Saturday's activities were held. The Vorplattler and presidents meeting was late Friday evening to finalize the preisplatteln schedule. For the first time, rooms were made available to the Vereine to practice before Preisplatteln. The 1. and 2. Gauvorplattler conducted a dance workshop for the first time early Saturday morning. Preisplatteln followed in late morning, and a record twenty-six Vereine participated. The banquet was in the North Exposition Hall of the Red Carpet complex. A parade of flags opened the evening's ceremonies; speeches, dinner, open dancing, and Ehrentänze followed. Sunday's activities were at Old Heidelberg Park. The morning's Trachtenzug was canceled because of the threat of bad weather. When weather conditions improved in mid-afternoon, D'Lustig'n Wendlstoana presented its program. Guests were presented with Fahnenbänder, and the guests in turn gave D'Wendlstoana beautiful gifts to commemorate the fiftieth anniversary. D'Oberlandler Los Angeles retained the Weitpreis. Preisplatteln awards went to: 3. Preis: D'Werdenfelser Sheboygan, 2. Preis: Bayern Verein Newark, 1. Preis: Bavaria Cleveland. We were privileged that members of Leiblachtaler Heimenkirchen of the Allgäuer Gauverband and D'Neuschwanstoaner-Füssen of the Oberlechgauverband attended. The Verein from Füssen was visiting D'Oberlandler Milwaukee. At the Gaufest, D'Neuschwantoaner Vorstand Karl Versal and Tony Mayer, 1. Gauvorstand, Oberlechgau, were recognized, and they provided some insight on what they saw while visiting with us. Trachtler and Trachtlerinnen from Germany took part in this Gaufest, and we were pleased to have them with us. A total of forty-four Vereine, including those from Germany, participated in the Gaufest. The nominations committee had a complete slate of candidates ready for the elections the following day. Joe Klingseisen reported on the 6. Gaufest in Milwaukee. He extended his apologies to the members of the Gauverband for the problems they had had with the hotel and food at the banquet. William Handeler, Original Enzian Glendale, proposed a sterling silver commemorative coin for the Gauverband with the Wanderpreis on one side and the Gauverband insignia on the other. The idea was approved, and William was asked to pursue the design and cost for action at the next executive meeting. Dennis Smith of D'Oberlandler reported on progress for the 7. Gaufest in Los Angeles. He said the Marriot Hotel had been reserved, and lodging prices would be moderate. Die Gemuetlichen Enzianer Maspeth and Edelweiß Detroit petitioned to host the 8. Gaufest in 1981. Edelweiß Detroit withdrew its bid because it had already hosted a Gaufest and wanted Die Gemuetlichen Enzianer to have the opportunity to host this Gaufest in conjunction with its fiftieth anniversary. D'Oberlandler Milwaukee offered to host the next delegates meeting in January 1980. The delegates accepted that offer; however, a motion to change the meeting to sometime in May was defeated. Although delegates had complained about the January weather, most said their Verein's lack of activities made it an excellent time for a delegates meeting. Changes on the executive board were minimal again. Rudi Hermes and Jerry Fischer were not delegates to the meeting so they were ineligible for reelection. To fill the vacancies, the delegates elected Erich Bayer, Die Gemuetlichen Enzianer, 1. Gauvorplattler; and Frank Fuchsburger, D'Holzhacker Milwaukee, Bibliothekar. Don Klingseisen was elected 2. Gauvorplattler; Toni Kronbeck, Edelweiß Buffalo, Revisor; and Dennis Smith, D'Oberlandler Los Angeles, and Marie Hugel, Schlierachtaler Stamm New York, Beisitzer. After the meeting, the delegates enjoyed music, songs, and Schuhplatteln; and an exchange of dances began spontaneously. The meeting was successful, and the delegates felt they were going in the right direction by shortening the business meeting to concentrate on dancing and learning more about Tracht and whatever else would help us promote and preserve our culture. Celebrations, 1978 During the 1978 delegates meeting, the delegates and their Vereine received invitations to some special events coming up that year. One of these was to celebrate the fiftieth anniversary and Fahnenweihe of the Schlierachtaler Stamm on May 26 through 29 at the Americana Hotel in Manhattan. The Fahnenweihe was at St. Patrick's Cathedral on Sunday followed by a banquet in the Royal Ballroom of the hotel. Saturday evening's boat cruise on the Hudson River was a chance for all to enjoy music and dancing. On the same weekend, D'Oberlandler Milwaukee celebrated its fiftieth anniversary. A banquet on Saturday evening was at the Bavarian Inn, and on Sunday the festivities began with presenting and blessing the Maibaum which stands outside of the Bavarian Inn. The picnic with music and dancing was in Old Heidelberg Park after the ceremonies. On July 1 and 2, Edelweiß Toronto celebrated its twenty-fifth anniversary with Fahnenweihe. The headquarters for this event was the Sheraton Center Hotel. The Fahnenweihe mass was at St. Michael's Cathedral followed by a Trachtenzug to Nathan Phillips Square in front of Toronto City Hall. The banquet in the grand ballroom of the hotel featured Herbert Hisel, a popular comic from Nürnberg, as master of ceremonies. Sunday's activities were at the city park on Toronto Island. Executive Board Meeting, Newark, 1979 Bayern Verein Newark invited the Gauverband officers to hold the executive board meeting in that city again. The meeting was on January 13 and 14, 1979, at Farcher's Grove. The agenda was lengthy, and all day Saturday plus Sunday morning were needed to complete it. The officers addressed several procedures for member Vereine to follow to help the officers function better. There was also discussion about the meetings and workshops at Gaufeste. Dennis Smith of D'Oberlandler Los Angeles reported on the 7. Gaufest plans for June 29 through July 1, 1979, and said that several Vereine from Germany were planning to attend. A revised edition of the bylaws was ready for distribution, and an up-to-date Trachtenkalender was in the making. It was suggested that copies of the Trachten Book, which was almost complete, be made available to member Vereine. The Gauverband coin design had been completed; minting would take about three months. Order forms and a photocopy of the coin would be sent to member Vereine to determine how many coins to obtain. Not long after the board meeting, the Vereine received information regarding the 7. Gaufest in Los Angeles. When the vote had been taken in Buffalo for this Gaufest, several delegates thought attendance would be low because of the high travel costs for some Vereine. But the cost of airfare had decreased considerably, providing incentive for many people to combine the Gaufest with vacation plans. Attendance estimates were high, and many were excited about going to California. Rudy Poelsterl Dies, 1979 But then news from Washington, D.C., saddened the members of the Gauverband. Rudy Poelsterl, the founding 1. Gauvorstand, had died on May 11, 1979. Rudy's death sent shock waves across the continent. It was his spirit and foresight that had brought the Vereine together to form the Gauverband Nordamerika. Gauvorstand Walter Wieand, GauKassier Marty Hubner, and Maryanne Hubner, president of the Vereinigte Bayern von Groß New York und Umgebung, attended the funeral. Rudy's death touched his many friends. The plans for the Gaufest continued; Rudy Poelsterl would not have wanted it any other way. Rudy was missed in Los Angeles, but he is even more sorely missed today. 7. Gaufest, Los Angeles, 1979 Trachtler and Trachtlerinnen from all over the United States, Canada, and Germany converged on the Los Angeles Marriott. The program for the weekend included a dance workshop on Friday afternoon and a presidents and Vorplattler meeting later that day. The meeting went quickly because all that was discussed was the weekend's program and sequence for Preisplatteln. Previous meetings had always included questions regarding preisplatteln rules, and prolonged discussions ensued. Directives from the executive board prohibited these discussions at Gaufeste because they were too disruptive. Such questions should instead be raised at delegates meetings. Preisplatteln on Saturday morning lasted about three hours with twenty-four groups participating. A banquet was held later that day in the grand ballroom and in an adjacent banquet hall, reserved because of the overwhelming attendance. The guests in the second hall could not see the festivities in the grand ballroom. A sound system was connected, but not seeing the parade of flags and the Ehrentänze was a loss. Sunday's activities and picnic were held beneath a Festzelt at Alpine Village. A Catholic mass was conducted before the opening of the festivities. After the parade of flags, there were Fahnenbänder presentations, speeches, and prize awards. Almrausch Poughkeepsie received the Weitpreis. The preisplatteln awards went to: 3. Preis: Bayern Verein Newark, 2. Preis: D'Werdenfelser Sheboygan, 1. Preis: Bavaria Cleveland. Bavaria Cleveland is the only Verein ever to win the 1. Preis four times. Ehrentänze continued through the afternoon and evening. Alpine Village, with its Bavarian-style architecture and small shops, lended itself ideally to a Gaufest. Many Trachtler and Trachtlerinnen stayed on in the Los Angeles area after the Gaufest for a vacation. Celebration, 1979 Enzian Volkstanzgruppe Delaware celebrated its 12. Stiftungsfest with Fahnenweihe on September 7 through 9, 1979. The festivities opened with a welcoming party on Friday. The Fahnenweihe at St. Peter's Cathedral was followed by a parade to Market Street Mall where the Trachtler and Trachtlerinnen danced a Massenplattler. The parade continued to the Radisson Hotel for the Saturday evening banquet and festivities. On Sunday, the festivities continued at the Delaware Sängerbund Park. The long-range planning committee appointed at the previous executive board meeting presented guidelines for addressing problem areas within the Gauverband or at Gaufeste. Only two offices changed hands during this election: Beisitzer, Erech Morrison, and Revisor, Ken Roberts. Edelweiß Denver and Bavaria Cleveland made their presentations to host the 1983 Gaufest. The delegates voted for Cleveland. D'Lustig'n Wendlstoana Milwaukee received approval to host the 1982 delegates meeting. Bayern Verein Newark invited the Vereine to its fiftieth anniversary celebration on March 8, 1980, and Bavarian Club Almenrausch Syracuse did likewise for its Fahnenweihe on July 4, 1980. Celebrations, 1980 Bayern Verein Newark held its fiftieth anniversary celebration at the Robert Treat Hotel in downtown Newark. A banquet followed the parade of flags and the opening ceremonies. Several Vereine performed Ehrentänze as did Bayern Verein's senior group and Kindergruppe. 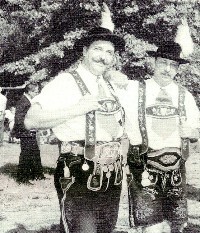 On July 4 through 6, 1980, Bavarian Club Almenrausch Syracuse held its Fahnenweihe. The Hotel Syracuse was the center of activity Friday and Saturday evenings. The flag blessing was Saturday afternoon at the Cathedral of the Immaculate Conception, followed by a short parade. The banquet was in the Hotel's grand ballroom, and a neighboring room was also rented because of the unexpectedly large turnout. On Sunday Fahnenbänder were presented at the picnic at Long Branch Park, and more Ehrentänze were performed. On August 29 several hundred Trachtlerinnen and Trachtler converged on the Chicago Marriott O'Hare hotel, the headquarters hotel for the Fahnenweihe celebration of D'Lustigen Holzhacker Buam, Chicago, Illinois. That evening, a welcome dance was held in the ballroom of the hotel, where guests reacquainted themselves or made new friends. On Saturday afternoon, August 30, the Fahnenweihe officially started. Busing was provided to Immaculate Conception Roman Catholic Church for the Fahnenweihe ceremony. All the Vereinsfahnen in procession with their members entered the church at 1 p.m. for the flag blessing. The ceremony followed traditional procedures with Verein members reciting poems that reflected the sincerity of their presentation. Later that day a banquet celebrating this Fahnenweihe was held in the ballroom of the Marriott O'Hare. A parade of flags opened the evening's ceremonies, followed by dinner, speeches, Ehrentänze, an Alpenhorn solo, and music for everyone's dancing pleasure. On Sunday, August 31, a picnic was held at Altenheim in suburban Forest Park, Illinois. A parade of flags signaled the beginning of Sunday's activities, followed by the presentation of Fahnenbänder to the visiting Vereine. Several gifts were also exchanged, followed by Ehrentänze performances throughout the afternoon. Executive Board Meeting, Buffalo, 1981 The executive board held its biennial meeting in Buffalo, New York, on January 17 and 18, 1981. The meeting, hosted by Edelweiß Buffalo, was at the International Institute Building in downtown Buffalo. The board selected the panel of fourteen preisplatteln judges from twenty-seven applications. Erich Bayer, 1. Gauvorplattler, presented a system of symbols for the judges to use when scoring a group, and he explained a training procedure he would follow for the upcoming judges training session in New York City. Erich wrote to the selected judges and sent them material to study before their training session. A letter was also sent to member Vereine notifying them that a judges panel had been selected to judge Preisplatteln at the 8. Gaufest. William Hubner described the preliminary plans for this year's Gaufest. The long-range planning committee reported that it was not receiving answers to its correspondence. The committee members were disappointed, but they decided to develop a form to distribute at the next delegates meeting for immediate responses. Some of the officers asked that the delegates meeting be held in May rather than January due to problems with traveling in bad weather. At the next delegates meeting, the board would recommend moving the meeting to the weekend in May that contained the first Sunday. 8. Gaufest, New York City, 1981 Die Gemuetlichen Enzianer celebrated its fiftieth anniversary in conjunction with the 8. Gaufest, and the Waldorf Astoria was the center of activity. Past preferences had been to hold the Gaufest over a Fourth of July weekend, and the Enzianer followed suit. Many Trachtler and Trachtlerinnen combined their vacation plans with the Gaufest to see the "Big Apple." Sightseeing tours were available, and the Waldorf was within walking distance of the theater district. Besides, just being in New York City was a great feeling. Friday, July 3, was a full day. Two well-attended dance workshops were held that afternoon. Later that evening the presidents and Vorplattler meeting and a welcoming dance took place. Early Saturday morning, rooms were available for preisplatteln practice. Nineteen Vereine were competing, and they appreciated this last-minute practice session. Preisplatteln started at 11 a.m. in the Grand Ballroom and took about two and a half hours. Everyone was anxious to know the results of the new judging system adopted at the 1980 delegates meeting. Several Trachtler and Trachtlerinnen from Germany attended the competition and were impressed. Forty-two members from Alpenrose Peiting, including their 1. Vorstand Hans Stöger, were on tour in the United States to attend the Gaufest and travel to Philadelphia and Washington, D.C. Ehrengast Hans Zapf, 1. Vorsitzender of the Vereinigte Bayerischen Trachtenverband e.V., attended and greeted our member Vereine on behalf of both the Bavarian Ministerpräsident Franz Joseph Strauss and the Trachtenverband. As the evening drew near, the Grand Ballroom came alive with Trachtler and Trachtlerinnen and was filled to capacity. The evening's festivities opened with the parade of flags, and the host Verein greeted the audience. Walter Wieand, 1. Gauvorstand, presented a plaque and a Gauverband coin to Hans Zapf to commemorate his visit. Die Gemuetlichen Enzianer, Alpenrose Peiting, and other Vereine performed Ehrentänze throughout the evening. Sunday's festivities were at the Plattdeutsche Park in Franklin Square, Long Island. The program opened with the parade of flags and national anthems. On behalf of the Bavarian Ministerpräsident, Hans Zapf presented a Fahnenband to Die Gemuetlichen Enzianer. Hans also presented Walter Wieand with a Bavarian shield plaque. After presentations to the participating Vereine, it was time to present Preise. Almrausch Vancouver was awarded the Weitpreis. Preisplatteln awards went to: 3. Preis: Edelweiß-Passaic, 2. Preis: Bavaria Cleveland, 1. Preis: Bayern Verein Newark. Each Verein performed its winning Schuhplattler. Ehrentänze, music, and dancing followed, completing the weekend's activities. It was suggested that a committee of past Gaufest chairmen and officers be formed to recommend ways to reduce costs of the Gaufest. The delegates accepted the executive board's recommendation to change future delegates meetings to the first weekend in May. The Vorplattler reorganized Article 9 of the preisplatteln rules; this article would not be included in the handbook. William Hubner reported on the results of the 8. Gaufest in New York City in 1981. George Schnur of Bavaria Cleveland discussed his Verein's preliminary plans for the 9. Gaufest. The Sheraton Hotel in downtown Cleveland would be the central facility. The majority of incumbents were reelected. Martin Hubner was not eligible for reelection as GauKassier; William Hubner was elected in his place. Rudi Hermes, Bavaria Cleveland, and Joe Weitzl, Alpenrösl St. Catharines, were elected Revisoren; Joe Gates, Holzhackerbuam Toledo, was elected a Beisitzer. The site for the 1984 delegates meeting was discussed. The number of attendees made it difficult for most Vereine to provide private lodging and thus to host a meeting. Holzhackerbuam Toledo presented its bid to host the meeting but only if the delegates stayed at a hotel; the delegates agreed. Edelweiß Denver was the only Verein bidding to host the 10. Gaufest in 1985, and the delegates accepted. Several Vereine announced their upcoming special events for 1982. Included were the Fahnenweihen of Alpen Schuhplattler- und Trachtenverein Pittsburgh, Edelweiß St. Paul, and Edelweiß Denver. In addition, Edelweiß-Passaic's twenty-fifth anniversary was only six weeks away. Celebrations, 1982 Edelweiß-Passaic's twenty-fifth anniversary celebration was at the Wayne Manor on February 27, 1982. The celebration included the parade of flags, a banquet, and Ehrentänze. On April 17, 1982, Alpengrün Rochester celebrated its fiftieth anniversary at the Rochester Hilton. Alpen Schuhplattler- und Trachtenverein Pittsburgh's Fahnenweihe on May 28 through 31 was at the Hilton Hotel in downtown Pittsburgh. The flag blessing at Epiphany Church was followed by a parade to Point State Park where the Trachtler and Trachtlerinnen danced the "Gauplattler." The evening's banquet was in the grand ballroom of the hotel and included Ehrentänze. On Sunday the Verein presented Fahnenbänder at a picnic at South Park. Edelweiß St. Paul's Fahnenweihe was on July 4 at the Volksfest Haus where the banquet and picnic festivities took place. The flag was blessed at St. Agnes Roman Catholic Church early Saturday afternoon. Edelweiß Denver's Fahnenweihe was over Labor Day weekend, September 3 through 5. The Hilton Hotel was headquarters for the celebration; the Friday evening welcoming dance was at the Vereinslokal. On Saturday the Vereine paraded to the Basilica of the Immaculate Conception for the flag blessing. A Trachtenkapelle from Oberried, Germany, led the parade to and from church. Edelweiß Denver's Patenverein D'Ammertaler Dießen/St. Georgen from Germany was on hand for the Fahnenweihe. So was Lorenz Haringer, 1. Gauvorstand of the Huosigau of which Edelweiß Denver is a member. The Trachtler and Trachtlerinnen danced the "Gauplattler" and the Huosigau's "Gauschlag" at the Civic Center before returning to the Hilton Hotel for Saturday evening's banquet in the grand ballroom. The Trachtenkapelle provided dance music that evening. Sunday's activities were at the Adams County Fairgrounds with Fahnenbänder presentations and Ehrentänze. Executive Board Meeting, Cleveland, 1983 The executive board was again preparing for its biennial meeting in January. Conflicts forced postponement of the meeting until February. The 1. Gauvorstand, Walter Wieand, contacted Rudi Hermes of Bavaria Cleveland to arrange to have the meeting there, thus allowing the officers a chance to visit the proposed Gaufest site. Bavaria Cleveland graciously agreed to host the meeting on February 5 and 6, 1983. Private lodging was provided for the officers, and the meetings were at the home of one of Bavaria Cleveland's members. John Schaefer and Ken Roberts did not attend this meeting because of schedule conflicts. The meeting started at 9:30 a.m. with reports from the 1. Gauvorstand, Schriftführer, and Kassier. The Kassier's report noted that dues of six Vereine were in arrears by more than four years. The officers recommended dropping Vereine from membership if their dues were more than two years delinquent. This recommendation was passed at the 1984 delegates meeting. The officers discussed the upcoming one hundred year celebration of Trachtenvereine in Bavaria which coincided with the Cleveland Gaufest. To commemorate this event, the officers suggested sending a congratulatory letter to Hans Zapf and making the one hundred year commemorative pins and coins available to our member Vereine. In addition, our Gaufest parade would be dedicated to the Trachtler and Trachtlerinnen celebrating in München. George Schnur, chairman of the 9. Gaufest, presented a report on the 1983 Gaufest. Joe Gates described the arrangements for the 1984 delegates meeting to be held in Toledo. Lodging would be at the downtown Holiday Inn, and the meetings would be at the Vereinslokal. The Holzhackerbuam would provide transportation between the sites. 9. Gaufest, Cleveland, 1983 Fifty-four Vereine were represented, requiring three hotels to accommodate the Trachtler and Trachtlerinnen. The Stouffer's Inn on the Square and the Hollenden House were primary facilities, with a Holiday Inn for the overflow. Stouffer's was the center of activity, and on Friday, July 1, a welcoming dance in the ballroom brought the Trachtler and Trachtlerinnen together. A presidents and Vorplattler meeting was also held on Friday to select preisplatteln order and dances for the twenty-six Vereine participating. On Saturday morning a practice area was available to the Vereine before the competition. Preisplatteln began at 10 a.m. and continued into the afternoon. Response to the post-competition dance workshop was better than expected. Plattler and Trachtentänze were presented, making this workshop a great learning experience. The banquet was in the Stouffer's ballroom where the parade of flags opened the evening's program. The Vereinsfahnen were then suspended from the balcony that surrounded the main floor of the ballroom. Guests were introduced; Ehrentänze and open dancing completed the evening's program. On Sunday the festivities continued in the main concourse of the former New York Central Railroad Terminal adjacent to Stouffer's Inn. Doors to the facility opened early that morning for food and refreshment. The Trachtenzug route in early afternoon led to Cleveland's waterfront area where hundreds of Trachtler and Trachtlerinnen danced the "Gauplattler." The weather was beautiful but hot and windy, and everyone was glad to return to the concourse for refreshments and the awards presentation. Almenrausch San Francisco won the Weitpreis. Preisplatteln awards were presented to: 3. Preis: Edelweiß Denver, 2. Preis: Bayern Verein Newark, 1. Preis: Bavaria Cleveland. Each of the prize winners performed its Plattler. The weekend drew to a close. Celebrations, 1983 On October 8, 1983, Edelweiß Buffalo celebrated its fiftieth anniversary with a rededication mass at St. Joseph's Cathedral in downtown Buffalo. Edelweiß hosted a welcoming party at the Executive Inn where the Vereine were staying. On Saturday Trachtler and Trachtlerinnen were bused to the cathedral for a German mass which was accompanied by the German-American Musician's Brass Band and the Schwäbische mixed chorus. Saturday's banquet was at Samuel's Grand Manor where the Vereine exchanged gifts and performed Ehrentänze. Alpen Schuhplattler- und Trachtenverein Pittsburgh presented Walter Wieand with a surprise "fiftieth" gift---not for the Verein but for Walter's own upcoming fiftieth birthday. The long-range planning committee was disbanded. The Gaufest steering committee was dealing with the subject of future Gaufeste. George Schnur of Bavaria Cleveland presented a report on the 1983 Gaufest, and Leo Mayer reported on progress for the 10. Gaufest in 1985. The election of officers brought little change. Tom Vogt, Alpenrösl St. Catharines, and Carl Grassi, Die Bergvagabunden Kingston, were elected Beisitzer; all other incumbents were reelected. Wilhelm Banzhaf, Alpen Schuhplattler- und Trachtenverein Pittsburgh, proposed a plan for a "Gauzeitung." The decision reached was to publish a pilot issue using the format of the trachten publication in Germany. Only a few Vereine in the Gauverband subscribe to the "Heimat- und Trachtenbote," and many delegates were not familiar with its format. A pilot issue would allow them to see it firsthand. 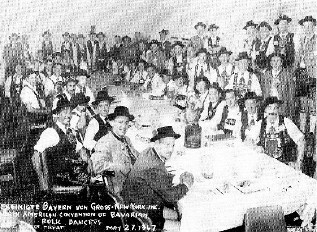 Bayern Verein Newark and Edelweiß-Passaic, jointly, and D'Oberlandler Milwaukee gave presentations promoting their areas for the 1987 Gaufest. Printed materials, slides, and movies explained each area thoroughly. Paul Ulrich and John Schaefer both added excellent presentations for their respective cities. When the final vote was taken, D'Oberlandler Milwaukee received approval. Toledo Mayor Donna Owens arrived at the Vereinslokal at the close of the meeting and presented a glass hospitality goblet to 1. Gauvorstand Walter Wieand, with an invitation to everyone to visit Toledo again. Celebrations, 1984 A few special events were scheduled for the summer months. Alpenland Hamilton (July 4) and D'Werdenfelser Sheboygan (Labor Day) extended invitations to their Fahnenweihe and fiftieth anniversary respectively. The members of Alpenland Hamilton welcomed the Trachtler and Trachtlerinnen to their Fahnenweihe on July 6 through 8, 1984. Lodging was at the Holiday Inn in downtown Hamilton. The flag was blessed on Saturday at the Cathedral of Christ the King, followed by a parade to the banquet at the Hamilton Convention Center. The festivities for the evening included a parade of flags, guest speakers, and Ehrentänze. On Sunday the outdoor picnic was at the Serbian Club Grove in suburban Hamilton. Later that summer, D'Werdenfelser Sheboygan celebrated its fiftieth anniversary. The schedule of events for that celebration included a welcoming party at the Grand Executive Inn on Friday, August 31. On Saturday the Trachtler and Trachtlerinnen paraded from the Fountain Park Motel to Holy Name Church for mass. A men's choir from Klingenbrunn, Bavaria, sang during the celebration of the mass. A banquet was later held in the Inn's ballroom. Ehrentänze and open dancing completed the evening's program. Sunday's outdoor picnic at Kiwanis Park included music for everyone's dancing pleasure. Executive Board Meeting, New York, 1985 On March 2 and 3, 1985, the executive board held a meeting at Lake Secor, New York, Die Gemuetlichen Enzianer's Vereinsheim. The officers were housed in the Vereinsheim and held their meetings at Lake Secor Community Center. Most of the officers arrived at Lake Secor on Friday evening and were greeted by members of Die Gemuetlichen Enzianer who were preparing the food and refreshments for the weekend. The meeting started early Saturday morning with officer reports. A description of the duties of the office of Vortänzerin was adopted; final approval would occur at the delegates meeting in Buffalo. Because the Gauverband pays the travel expenses for judges training, the officers recommended that the present Gaufest assessment be raised to $1 per ticket sold to help defray these costs. Outgoing officer recognition had been a topic of discussion for several years. The officers were a bit uncomfortable making this decision but felt that action had to be taken. They decided that an officer with at least six years of service to the Gauverband should be recognized with an Urkunde, and pins should be presented to all outgoing officers regardless of service years. Pins for the members of the Gauverband judges panel were also approved, and guidelines were set for their distribution. The Gaufest steering committee reported that it had not received feedback from the Vereine; therefore, the officers adopted the report submitted at the delegates meeting in Toledo. The "Gauzeitung" was also discussed, and 1. Gauvorstand Walter Wieand requested that officers submit articles for a pilot issue. Guidelines were set up to revalidate all judges panel applications to determine whether the judges wished to remain on this panel. The executive board would review these applications regularly at its meetings. The Germania Club of Colorado Springs informed the GauKassier that its Schuhplattler group was no longer part of the Verein and that future correspondence be directed to the parent club. Walter Wieand, 1. Gauvorstand, reported on his trip to Germany and said that he and his wife were well received every place they visited. They attended a Gaufest in Wildsteig as Ehrengäste of the Oberlechgauverband, observed a Gauverband Judgendparade in Garmisch (Oberlndler Trachtenvereinigung), and visited with Vereine in München (Isargau). Hans Zapf, 1. Vorsitzender of the Trachtenverband, and Albert Tschaffon, 1. Gauvorstand of the Isargau, gave Walter commemorative pins which he presented to each of the officers. Walter Wieand outlined the format for the Gauverband's written twenty-year history and told what preliminary plans had been made for the twentieth anniversary delegates meeting to be held in Buffalo, New York, in May 1986. The board approved the plan for this celebration. 10. Gaufest, Denver, 1985 The Marriott City Center Hotel in downtown Denver was headquarters for this Gaufest hosted by Edelweiß Denver. Banquet, Preisplatteln, and lodging were all within the hotel. On Friday afternoon two dance workshops were conducted; one was to review the "Gauplattler." In the other, Die Gemuetlichen Enzianer Maspeth taught the "Stern Polka." A presidents and Vorplattler meeting was held later that day to review the weekend program and to draw lots for preisplatteln order for the twenty-two competing Vereine. Fifty-three Vereine were represented at the Gaufest including D'Ammertaler Dießen and Hemau Stamm from Germany. The five final judges for the competition were selected at that time, and they later met for instructions from the Gauvorplattler. That evening a welcoming dance was held. On Saturday the dance practice rooms were open early for the participating Vereine to warm up before competition. Preisplatteln started at 10 a.m. in the ballroom, and plenty of spectator seating was available. The era of videotaping was upon us, and a closed-circuit television screen outside the ballroom allowed those in the lobby to watch the competition. That evening a parade of flags opened the banquet, attended by about 1500 Trachtler, Trachtlerinnen, and friends. The Gauvorstand stressed the Jahr der Jugend (Year of the Youth) to the assembly. He urged the Vereine to teach the youth about our culture and encouraged participating in the Bavarian culture not only in their home cities but also at Feste such as the Gaufest. Ehrentänze were performed, and music and dancing completed the evening's program. On Sunday a Trachtenzug started the day's activities. The Trachtler and Trachtlerinnen paraded about one mile from the hotel to Currigan Hall (Denver's Convention Center) where they danced the "Gauplattler" and the "Gauschlag." Sunday's activities were inside Currigan Hall, and Edelweiß Denver presented Fahnenbänder to all the Vereine. Sepp Kaindl, 1. Gauvorplattler des Huosi-gauverband in Bayern, expressed his happiness at being invited to participate in the Gaufest and said he was very pleased with what he saw. He and the Trachtler and Trachtlerinnen from D'Ammertaler Dießen performed an Ehrentanz that delighted everyone. The highlight of the afternoon was the awarding of prizes. Almenrausch San Francisco relinquished the Weitpreis to Original Auerhahn Miami. The preisplatteln awards were presented to: 3. Preis: Edelweiß Denver, 2. Preis: Bayern Verein Newark, 1. Preis: Bavaria Cleveland. Each team performed its prizewinning Plattler. After the awards, D'Werdenfelser Sheboygan's junior dancers performed an Ehrentanz in the hopes that their performance would encourage other Vereine to do the same at future Gaufeste. By late afternoon the Trachtler and Trachtlerinnen began leaving the convention hall and returning to the hotel for rest or more socializing. On Monday evening many Trachtler and Trachtlerinnen participated in a tour of Coor's Brewery in Golden, Colorado. Celebrations, 1985 The summer months passed quickly after the Gaufest. D'Holzhacker Buam Milwaukee's fiftieth anniversary celebration was August 30 and September 1, 1985, at the Marriott Hotel in Brookfield. A welcoming dance was held in the hotel on Friday evening. On Saturday, a banquet in the ballroom celebrated the golden anniversary. Ehrentänze and open dancing alternated throughout the evening. Sunday's program was at Heidelberg Park in Glendale. An outdoor mass at noon preceded the opening ceremonies. The ceremonies started with a parade around the park; the presentation of Fahnenbänder and Ehrentänze followed. Open dancing completed the entertainment for this celebration. With the addition of these Vereine, total membership was brought to sixty-seven Vereine. "Gauzeitung:" The delegates approved publication of the "Gauzeitung" after reviewing the pilot issue that was sent out earlier in the year. Ten issues will be printed annually. Since its inception, the "Gauzeitung" has become a very important communication tool for the Vereine and the Gauverband and has been well received by the membership. Proposals for establishing the office of Gaujugendvertreter and to enact a standing flag committee for Verein flags were approved for further study by the executive board. The delegates also approved a proposal to "normalize" preisplatteln scores. To cover training costs of the judges, a $1 assessment on Gaufest banquet tickets was instituted. The election of officers brought some changes to the Vorstandschaft. Erich Bayer, 1. Gauvorplattler, was unable to attend the meeting and sent his regrets to the Gauvorstand that he would not run for reelection or for any other office at this time. His presence was missed, and his eight years as Gauvorplattler were recognized. Don Klingseisen was elected in his stead and Martin Hubner as 2. Gauvorplattler. Marie Hugel was elected to the new office of Gauvortänzerin. Leo Mayer and Rex Lane were elected as a Beisitzer and Revisor respectively. With Saturday's business completed, the delegates assembled for the twentieth anniversary banquet. About two hundred delegates, alternates, and spouses attended the banquet. An Oktoberfest theme enhanced the decoration and the buffet that was served. Refreshments were also available at the beer garden stations. The formal program was well received. Walter Wieand, 1. Gauvorstand, read a memorial in remembrance of deceased members, in particular Rudy Poelsterl, the first Gauvorstand. Mollie Poelsterl received a bouquet of flowers for her understanding and support of husband Rudy during his tenure as Gauvorstand. Charter membership and membership certificates were presented to the delegates for their respective Vereine as the final part of the program. The balance of the evening yielded to socializing, music, dancing, and Schuhplatteln until the early hours. The meeting reconvened on Sunday morning, and the remainder of the reports were read and approved. The site for the next delegates meeting was selected. Before adjournment, Alpenrösl St. Catharines and Edelweiß Chicago announced their Fahnenweihe and seventy-fifth anniversary celebration respectively. Celebration, 1986 The next scheduled event was Alpenrösl St. Catharines' Fahnenweihe on September 5 through 7, 1986. On June 15, 1985, Alpenrösl had formally asked Edelweiß Buffalo to be its Patenverein at a Patenbitten at Edelweiß's Vereinslokal. For the Fahnenweihe weekend, the Howard Johnson Motor Hotel and Holiday Inn were the two hotels that housed about six hundred out-of-town guests. Club Heidelberg was the scene of the welcome dance on Friday evening. The Fahnenweihe was in the Cathedral of St. Catherine of Alexandria followed by a parade to Montebello Park for the "Gauplattler." The parade continued to the C.A.W. Banquet Hall where the banquet and Saturday evening festivities were held. On Sunday the festivities continued at the Club Heidelberg with presentations of Fahnenbänder and the farewell dance. Several Ehrentänze were performed before everyone returned to their home cities. Executive Board Meeting, 1987 On March 7 and 8, 1987, the executive board held its biennial meeting in Milwaukee, Wisconsin. SVEV D'Oberlandler hosted the meeting at the Bavarian Inn in suburban Glendale. The majority of the officers arrived Friday evening and were greeted by members of the host Verein. The meeting started at 9 a.m. on Saturday when several officers reports were read and accepted. The wording for the job description of Gaujugendvertreter and the accompanying bylaw changes were adopted and would receive final approval at the next delegates meeting. The office of Gaupressewart was also established. His responsibilities would include reporting on Gauverband activities in the "Gauzeitung" and the "Heimat- und Trachtenbote," and being editor of the "Gauzeitung." Wilhelm Banzhaf was immediately named to this appointed position. Designs for the Gau-judges pins and past officer pins and awards were approved. The making and distributing of these pins was targeted for the next Gaufest. Walter Wieand, 1. Gauvorstand, said that Hans Zapf, 1. Vorsitzender der Vereinigte Bayerische Trachtenverbnde, had extended an invitation to attend the opening ceremonies and parade of the Oktoberfest and to attend the 62. Jahrestagung of the Trachtenverband. Dennis Smith, chairman of the 11. Gaufest, reported on D'Oberlandler Milwaukee's plans which were well underway. Paul Ulrich reported on the preliminary plans for the 12. Gaufest. The Beisitzer presented guidelines for the Bibliothekar and for the display of the Gau flag and recommended their adoption. The size of the judges panel was increased, and several other guidelines were adopted to enhance the judges panel. An alternate membership status was approved to give relief to Vereine that have financial hardships. The meeting recessed to tour the facilities for the next Gaufest, which was one of the purposes for having the meeting in Milwaukee. After the business was completed, the officers were invited to attend D'Lustig'n Wendlstoana's 60. Stiftungsfest on Sunday afternoon and evening in the Bavarian Inn. The Verein provided a full program, including a play "Aus Böhmen--Mit Liebe," performed in German with music and Schuhplatteln as part of the script. The performers were members of D'Lustig'n Wendlstoana. Attending the Stiftungsfest gave the officers a chance to socialize after a weekend of work. Afterwards, their thoughts shifted to their return to Milwaukee on July 3 through 5 for the 11. Gaufest. 11. Gaufest, Milwaukee, 1987 A mere four months later, the 11. Gaufest was underway. The Marc Plaza Hotel in downtown Milwaukee was the headquarters hotel. The Howard Johnson Hotel and the Ramada Inn were also used to house the members of the sixty-five Vereine that met in Milwaukee that weekend. Six of these Vereine were potential Gauverband members, some of which were attending a Gaufest for the first time. Three Vereine were from Bavaria: D'Neuschwanstoaner of Füssen, Alt Rosenheim from Rosenheim, and D'Leiblachtaler of Heimenkirch represented the Oberer Lechgauverband, Bayerischer Inngau, and the Allgäuer Gauverband respectively. Max Bertl, 2. Gauvorstand, Oberer Lechgauverband also attended. On Thursday evening, a Heimatabend was held at the Bavarian Inn for those arriving early. The Heimatabend was such an overwhelming success that it prompted some rethinking for future Gaufeste. Friday was a full day of activity starting in the afternoon with three workshops, one reviewing Tracht, the other two to study Schuhplattler dances. The Plattler from Alt Rosenheim participated in one of the dance workshops which was a welcomed overture. The presidents and Voplattler meeting was held later that day to review the weekend program and to draw lots for the Preisplatteln order and dance. The judges were also selected at the meeting and met with the Gauvorplattler and Gauvortänzerin for instructions. Later that evening a welcome dance was held in the Crystal Room of the Marc Plaza Hotel for all the Trachtlerinnen, Trachtler, and friends. Saturday's activities started with the opening of the Preisplatteln practice rooms at 9 a.m. to allow each group last minute rehearsal and warm-up before the competition. Preisplatteln started at 10 a.m. in the Crystal Room. Plenty of seating was available for everyone who watched the competition, which continued until early that afternoon. The banquet was held at the Mecca Center which is Milwaukee's downtown convention center near the hotels. About 2100 Trachtlerinnen and Trachtler attended the banquet. The festivities started with the parade of flags and the national anthems. Several speakers from the community were introduced, and 1. Gauvorstand Walter Wieand presented Ehrenurkunden to the attending past officers and to Mollie Poelsterl who accepted posthumously for Rudy Poelsterl. Four past officers were not able to attend and received their Urkunden at a later date. The host Verein, the Vereine from Bavaria, and other Vereine performed Ehrentänze throughout the evening. Music for everyone's dancing pleasure rounded off the evening program. On Sunday a Bauernmesse at the Bavarian Inn park started the day's activities. A parade of flags opened the afternoon program. All the Vereine were sheltered under the new Festzelt in the park. D'Oberlandler presented Fahnenbänder to the participating Vereine. The highlight of the afternoon was the awarding of prizes. D'Lustig'n Wendlstoana Milwaukee received the Meistpreis, with Almenrausch San Francisco accepting the Weitpreis. Preisplatteln awards were presented to: 3. Preis: Edelweiß Denver, 2. Preis: Bayern Verein Newark, 1. Preis: Bavaria Cleveland. The Vereine performed their Preisplattler before receiving their awards. Max Bertl, 2. Gauvorstand, Oberer Lechgauverband, presented STV Bavaria with a copy of the Oberer Lechgauverband Chronik for winning first prize. He also presented a wooden plate from his hometown of Wildsteig to Walter Wieand. Karl Versal presented Walter Wieand with a large, decorative Alpine bell to use to open the delegates meetings. By late afternoon, attendance at the park began to thin out. Another successful Gaufest came to an end. The delegates selected Almrausch Vancouver to host the 13. Gaufest in its city. Invitations were extended by three Vereine to host the fourteenth delegates meeting in their city. Alpenklang Troy, Alpenrose Orlando, and Edelweiß Denver made their presentations, and the delegates selected Orlando, Florida, as the site for the 1990 meeting. The 1. Gauvorstand presented past officer pins to six delegates attending the meeting. The judges panel for Preisplatteln was expanded to sixteen members with its future size open-ended to allow the executive board to add judges as needed. The elections brought few changes in the Vorstandschaft. Karin Dean was elected Gauvortänzerin, and Mark LaCourse and Hans Henoch were elected Revisor and Beisitzer respectively. Rex Lane was elected to the newly created office of Gau-Jugendvertreter. After a very successful meeting, the delegates thanked the members of Alpen Schuhplattler- und Trachtenverein for their hospitality and labors for making this meeting possible. Celebrations, 1988 The next four weeks passed quickly, and Alpenveilchen Silver Spring as well as D'Fröhliche Schuhplattler St. Louis were awaiting the arrival of Trachtlerinnen and Trachtler to their Fahnenweihen on May 27 through 29. Alpenveilchen was celebrating its twentieth anniversary in conjunction with its Fahnenweihe. About 250 Trachtlerinnen and Trachtler met at the Radisson Mark Hotel in Alexandria, Virginia. All of the festivities were held within the grounds of the hotel. The flag blessing was outdoors on Saturday morning with an altar set up adjacent to a small lake. Beautiful spring weather complimented the setting with birds singing and two Alpenhorn providing musical tones. The parade of flags around the lake after the service provided a colorful preview of events that were to take place that weekend. Special guests from Gauverband I were in attendance, and a dance workshop was held where they demonstrated dances from their region. Later that day the banquet was held in the hotel. Ehrentänze and music followed to round off the evening program. On Sunday afternoon the picnic on the hotel grounds included presentations of Fahnenbänder. Bell ringing, music, Ehrentänze, refreshments, and visiting filled the afternoon activities. At the same time in another part of the country, D'Fröhliche Schuhplattler St. Louis was conducting its Fahnenweihe. About five hundred Trachtlerinnen and Trachtler converged on the Clarion Hotel on Friday, and that evening a welcoming dance brought everyone together. On Saturday morning a meeting was held to review the events of the weekend. Early that afternoon the Fahnenweihe was held at the Old Cathedral near the Gateway Arch. A parade followed through downtown St. Louis to the May Amphitheater for the "Gauplattler." The banquet Saturday evening was in the Meramec Ballroom of the Clarion Hotel, complete with speeches, Ehrentänze, and music for everyone's dancing pleasure. On Sunday the picnic dance was held aboard the entertainment ship "Admiral" moored on the Mississippi River near the Arch. There were several visitors from Bavaria including Karl Versal, 1. Vorstand of D'Neuschwanstoaner Füssen. On June 11 and 12 a Maifest with a Maibaum dedication was sponsored by the German-American Festival Society (GAF) at Oak Shade Grove in Oregon, Ohio, a suburb of Toledo. Holzhackerbuam Toledo, a member Verein of the GAF, was instrumental in the design, construction, erection, and dedication of the Maibaum. Through the Holzhackerbuam, eight Vereine of the Gauverband participated in the Maibaum Gründungsfest. Unbeknown to the Holzhackerbuam members, their trachten friends were going to follow Bavarian tradition and take the Maibaum hostage before the dedication ceremonies. Only when a Trachtler attached the "Beschlagnamt" sign (an official declaration that the Maibaum was taken hostage) and the other visiting Trachtler and Trachtlerinnen encircled the base with a chain and padlock did the Holzhackerbuam realize that the kidnappers were serious. A few demonstrations of the "Holzhacker" on logs brought the parties to the negotiation table where the terms were resolved with a payment of a half-barrel of beer. Dedication ceremonies around the Maibaum were held both days with the unveiling of its nine tiers on Saturday evening. The parade of flags started the activities each day, and about 1600 guests took part in the celebration including members of D'Oberlandler Milwaukee, D'Lustig'n Wendlstoana Milwaukee, Alpen STV Pittsburgh, Edelweiß Detroit, Edelweiß Chicago, Bavaria Cleveland, Clevelander of Cleveland, Heidengold Rochester, Almenrausch Syracuse, and Alpenrösl St. Catharines. While the Toledo sister societies' "spirit of unity" made the Maibaum possible, the visiting Trachtenvereine enhanced the traditions and paralleled the Maibaum's symbolic meaning. A full program of music and dancing, Ehrentänze by the Vereine, and socializing complimented the weekend's activities. Three short weeks later, Alpenklang Troy was host for its Fahnenweihe and tenth anniversary celebration. About 460 Trachtlerinnen, Trachtler, and friends filled the Holiday Inn and Super 8 Motor hotels on Friday, July 1. A welcoming dance was held on Friday evening at the Germania Hall. Dinners were served, and music and Ehrentnze filled the evening program. On Saturday, July 2, at 9 a.m. a presidents and Vorplattler meeting was held to review the ceremony and program for the weekend. Busing was provided to St. Patrick Roman Catholic Church where the Fahnenweihe took place. The celebrant for the Fahnenweihe was the Most Reverend Howard Hubbard, Bishop of the Albany Diocese, and twenty-nine Vereine were on hand to witness the flag blessing. This nineteenth-century church had the unique feature of a main floor that descends twelve feet from the back of the church to the altar, allowing everyone in the church to see the ceremony. After the church services, all the Trachtlerlinnen and Trachtler paraded from the church to Troy's Monument Square to perform the "Gauplattler." The members of Alpenklang led the parade with their newly blessed flag. 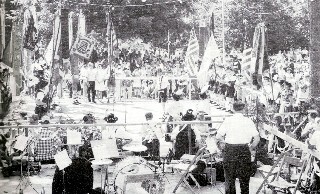 A band concert was held at Uncle Sam's Memorial Park after the Massenplattler in Troy City Square. Two bands alternated periodically to keep everyone entertained, and it gave everyone a chance to socialize before the evening banquet. Busing was provided from the hotels to Empire State Plaza Convention Center. The banquet hall was a three-tiered facility which provided excellent viewing of the parade of flags, Ehrentnze, and general dancing regardless of one's seating location. The evening was filled with Gemütlichkeit. On Sunday, July 3, the Vereine were bused to Colonie Elks picnic grounds. The picnic area opened at noon, and food and refreshments were served. Tables were placed in and around a pavilion where the orchestra played and Ehrentnze were performed. The exchange of gifts and Fahnenbänder followed the parade of flags. The balance of the afternoon was filled with music and song, dancing, and visiting. Five weeks later, on August 5 through 7, Almenrausch San Francisco held its Fahnenweihe. This was the first Fahnenweihe on record held in the "Golden Gate City." The Sheraton Palace Hotel was the center of activity for the welcome dance and banquet. Both of these events were held in the Garden Court Skylight Room whose architecture from a bygone era is fit for a king. Seventeen Vereine participated in the Fahnenweihe including HTV D'Würmtaler Menzing (Bayern) and Almenrausch's Patenverein, Die Gemuetlichen Enzianer Maspeth. Friday evening's welcome dance brought all the Vereine together for an evening of renewing acquaintances. The Edelweiss Sextet provided music for dancing. Ehrentnze and the "Gauplattler" were performed, with members of D'Würmtaler Menzing providing Stubenmusik. Almenrausch presented beautiful commemorative parade signs to all the participating Vereine and the Gauvorstand for the Gauverband. Saturday morning sunshine brought out the best in everyone but especially relief to Almenrausch's members. The parade to St. Patrick's Church started early in the afternoon with the new flag wrapped in the flower-decorated cradle. The Fahnenweihe started at 2 p.m. as the Verein, followed by its Patenverein, entered the church. A large loft choir sang, accompanied by a large pipe organ. The parade of flags, the procession that preceded the ceremony, and the blessing itself were very moving. Rev. Tony Thurston, a member of the Verein, performed the blessing in true tradition. The church services ended with Almenrausch leading the procession from the church to the sounds of the church bells. Upon leaving the church, the Vereine paraded to Union Square in downtown San Francisco where they performed the "Gauplattler," "Haitauer," and "Reit-im-Winkl." The parade then continued to the hotel where the banquet in the Garden Court started at 6 p.m. The festivities opened with the parade of flags, national anthems, introductions, and greetings by special guests. Ehrentänze and music for everyone's dancing pleasure followed. On Sunday busing was provided to the Flood Park picnic grounds in San Mateo County. The festivities opened with the parade of flags followed by the Almenrausch Kindergruppe releasing white and blue balloons. Gifts and Fahnenbänder were exchanged by Almenrausch and the visiting Vereine. Almenrausch senior dancers and Kindergruppe performed Ehrentnze. Music for dancing and time for visiting with one another completed the day's program. The last of four beautiful Fahnenweihen in North America in 1988 came to a close. Executive Board Meeting, Newark, 1989 The executive board meeting was held in Short Hills, New Jersey, at the home of Peter Mattheis, president of Bayern Verein Newark, on March 4 and 5. Edelweiß-Passaic and Bayern Verein Newark jointly hosted the meeting. All the officers were housed in private homes, and the hospitality extended to them was outstanding. The officers arrived on Friday evening for a bit of socializing before the long, arduous meeting that awaited them. All officers were present except Gauvorstand Walter Wieand, whose father had died two days before the meeting. John Schaefer, 2. Gauvorstand, chaired the meeting. The meeting convened at 9 a.m. on Saturday morning with several officers and committee reports read and approved. Through a proposal by Walter Wieand, 1. Gauvorstand, and Karin Dean, Gauvortänzerin, to publish a "Chronik" similar to those published in Bavaria, the officers unanimously adopted the suggestion and recommended it be published for the twenty-fifth anniversary of the Gauverband Nordamerika. A Chronik committee was formed which included Karin Dean; Walter Kraft, Gauschriftführer; Lloyd Wevang, Archivar; Wilhelm Banzhaf, Gaupressewart; and Walter Wieand. The officers adapted a new meeting format for the delegates meeting to provide a scheduled time for cultural seminars. The cultural areas to be covered included Tracht, Volkstanz, music, customs and tradition, and theater. These were proposed in addition to the administrative and preisplatteln meetings. An increase of $1 to the Gaufest assessment was recommended to cover the training and other expenses that the Gauverband is incurring. This would bring the total assessment to $2 per person attending a Gaufest banquet. The Bibliothekar, Jerry Fischer, reported that the inventory of library materials has become extensive, making it difficult to transport to the various Feste. The officers recommended that only one copy of each publication be shown at the Feste so that orders could be handled through the mails. Karin Dean, Gauvortänzerin, developed a suppliers list and "Tips for Trachten Care" for the member Vereine to aid in purchasing Tracht in the United States, Canada, or Germany. A recommendation to provide a separate fund for Gau flag repairs and/or replacement was adapted. A yearly deposit of $250 was recommended for this fund. Paul Ulrich, chairman of the 12. Gaufest, presented a Gaufest update. He also conducted a tour for the officers of the hotel facilities and the Sports Arena to be used for the Gaufest. Before the conclusion of the meeting, invitations were extended by Alpen STV Pittsburgh for its twenty-fifth anniversary celebration, and Edelweiß Chicago for its seventy-fifth anniversary celebration. Celebrations, 1989 On April 8 and 9 Alpen STV Pittsburgh celebrated its twenty-fifth anniversary in true Bavarian spirit. The Sheraton Hotel at Pittsburgh Station was headquarters for the entire celebration, which started Saturday afternoon. About 350 Trachtler, Trachtlerinnen, and friends, representing six Schuhplattler-Vereine and the Pittsburgh Bezirk Singers attended. A welcoming dance opened the day's activities on Saturday afternoon for casual visiting. On Saturday evening a banquet was held in the main ballroom of the Sheraton. The Einmarsch and parade of flags opened the evening's festivities, followed by an Alpenhorn duo and traditional Dorfmusik during dinner. The fest menu featured Bavarian specialties, which complemented the evening's theme. The highlights of the evening were many, and the participation of the Verein's Kindergruppe performing the "Schleifertanz" for the first time stole the show. Alpen STV senior dancers as well as the visiting Vereine performed Ehrentnze. Congratulatory messages were extended, and a proclamation from the city's mayor marked the weekend as "Alpen Schuhplattler Days." Dance music completed the evening's celebration in true Bavarian spirit. At 10 a.m. Sunday morning, a Bauernmesse was held in the Sheraton Hotel ballroom. A wooden altar was constructed and beautifully decorated with wild and domestic flowers. The setting, although indoors, was true to Bavarian tradition. The seating in front of the altar, the musical accompaniment, and the choruses all made one believe that this celebration was taking place in Bavaria. The mass celebration opened with an Alpenhorn duo followed by hymns by the Bezirk Singers of Pittsburgh. The Alpen Schuhplattler Chorus sang the Bauernmesse as Fathers Edward Schleicher, Arthur Hauser, and Hammer concelebrated the Bauernmesse in German. The service concluded with the choruses and everyone in attendance singing the "Bayernhymne." The entire celebration was a very moving and unforgettable experience. After the ceremony, an Aufwiedersehen dance was held where a brunch was served and music played to complete the weekend festivities. Edelweiß Chicago, the oldest Schuhplattlerverein in the United States and in the Gauverband Nordamerika, celebrated its 75. Jubiläum the weekend of May 26 through 28. The Westin O'Hare was the headquarters hotel for this event. A welcome party on Friday evening at the hotel opened the festivities for the weekend. On Saturday evening a banquet commemorated this milestone. Seventeen Vereine from the Gauverband attended to pay tribute to Edelweiß's Diamond Jubilee. Several dignitaries from the greater Chicago area, as well as the German community, were present. Members were recognized for their dedication to the Verein as well as to the German community. The Deutschmeister Blaskapelle provided dance music, and the host and visiting Vereine performed Ehrentnze. On Sunday afternoon a Catholic mass was held at St. Norbert's Roman Catholic Church in Northbrook, Illinois, followed by a Nachfeier at the church hall. Edelweiß presented Fahnenbänder to the participating Vereine, and more Ehrentänze were performed to salute the Verein and its membership on this great occasion. One week later a Trachtenwallfahrt sponsored by the Vereinigte Bayerische Trachtenverbnde was held in Altötting, Bavaria. The Trachtenwallfahrt commemorated the five hundredth anniversary of the first Marienwallfahrt in Altötting. An invitation was extended to the Gauverband Nordamerika to participate if possible. Walter Wieand, 1. Gauvorstand, attended the Wallfahrt and the festivities surrounding this religious event. Trachtlerinnen and Trachtler from all over Bavaria converged on the small town of Altötting. About fourteen thousand participated in the procession and mass that was offered for that occasion. Four parades formed at different areas outside the village and converged simultaneously on the Kapellenplatz. A crucifix led each parade, the marchers proceeding slowly while praying the Rosary. Walter Wieand was an honorary guest and marched with Sepp Mayer, 1. Gauvorstand, Loisachgau, one of the parade marshals for the Trachtenzug to the Kapellenplatz.The mass was celebrated outdoors where folk singers and Trachten-Blaskapellen accompanying the celebrants. After the religious ceremony various government officials, Gauvorstände from the Trachtenverbnde, and Walter Wieand, attended a dinner commemorating this anniversary celebration. Walter was given the opportunity to extend greetings from our Gauverband as well as to participate in the exchange of gifts. 12. Gaufest, Parsippany, 1989 On Thursday, June 29, the 12. Gaufest committee welcomed the Trachtlerinnen, Trachtler, and members of the Gauverband Nordamerika Vereine at the registration booths of the Hilton and Marriott Hotels in Parsippany, New Jersey. Registration booths were open on Friday and Saturday because of the scheduled arrivals of the participants for the four-day Fest. Sixty-five Gauverband Vereine and two Vereine from Bavaria---Edelweiß Stamm 1893 from München and D'Ammertaler from Dießen/St. George---registered for the Gaufest. On Thursday evening, a welcome dance was held at the Hilton Hotel where many of the Trachtlerinnen and Trachtler gathered to mingle with friends old and new. Friday, June 30, was filled with several activities starting with two dance workshops, a jugend workshop, and trachten workshop. Also included for the first time was a Schafkopf Tournament. The Gauverband library was open and displayed music and dance materials and educational literature. The Gauverband executive board also held a meeting that day. The activities were well attended, which demonstrated everyone's interest in bayerische Brauchtum. Because of the large number of Vereine participating in the Gaufest, a Heimatabend was arranged for Friday, June 30, at the Hilton Hotel. This enabled Vereine to perform over a three-day period instead of the usual two days and at a reasonable hour. The Heimatabend allowed for a greater variety of performances, and it was well received by everyone. Preisplatteln brought everyone together on Saturday morning. Practice rooms were opened at 9:30 a.m. with Preisplatteln starting at 10 a.m. in the Hilton Grand Ballroom. Twenty Vereine competed in Preisplatteln, and each dance group showed its best, creating excitement and suspense for all participating Vereine as well as for the audience. A VIP reception took place later in the afternoon, and buses to the Aspen Hotel Ballroom departed from the hotels shortly thereafter. The ballroom was opened at 5:30 p.m., and the parade of flags commenced at 6 p.m. Total attendance at the banquet was about 1900. Following dinner, guests were introduced and Ehrentnze were performed, and open dancing completed the banquet hall activities. After the banquet, the hotels provided facilities for after-hours parties, and the social aspect of the Gaufest heightened into the later hours of the night. On Sunday morning a Bauernmesse was celebrated in the Hilton Hotel ballroom. Father Gabriel was the celebrant and the Alpen Schuhplattler Choir, accompanied by zither music, sang the mass. After mass the buses were readied to transport everyone to the Mennen Arena where the Gaufest festivities continued. The day was very hot but the arena was air conditioned, much to everyone's relief. The parade of flags opened the festivities in the arena, followed by the presentation of Preise. Die Gemuetlichen Enzianer Maspeth won the Meistpreis, and Edelweiß Denver received the Weitpreis. Preisplatteln awards were presented to: 3. Preis: Die Gemuetlichen Enzianer Maspeth, 2. Preis: Edelweiß-Passaic, 1. Preis: Bayern Verein Newark. Each of the prize winners performed its Plattler. The ceremony concluded with presenting Marie Fischer with a recognition award honoring her late husband, Bill Fischer, to whom the 12. Gaufest was dedicated. Ehrentnze and open dancing completed the afternoon's activities, and the participants returned to their respective hotels before the evening's farewell dance at the Hilton Hotel ballroom brought the weekend to a close. Celebrations, 1990 Gauverband activities after the Gaufest in Parsippany, New Jersey, were low-key for several months. On April 22, 1990, Original Enzian Glendale held a Fahnenweihe for its restored Fahne. The flag blessing was at Sacred Heart Roman Catholic Church in Glendale. The members of Original Enzian and Patenvereine Die Würzburger and Ridgewood Bayern marched into the church at 2 p.m. "Grosser Gott Wir Lieben Dich" was sung by Original Enzian members as they led the procession into church. Reverend John Hartmann was the celebrant, and "Patrona Bavariae," a song about a prayer to the Blessed Mother, Bavaria's Patron Saint, was sung after the blessing.After church ceremonies, the Original Enzian senior, junior, and children dancers performed a Massenplattler outside the church. Then, together with the two Patenvereine, the members marched to the Glendale Memorial Building where a festive dinner and dance was held. One week later D'Lustigen Isartaler Pittsburgh celebrated its fifteenth anniversary with a Trachtenwallfahrt on April 29, 1990. This was the first Trachtenwallfahrt (pilgrimage) held by any Verein in the Gauverband. The festivities started on Friday, April 27, at the Teutonia Männerchor Clubhouse with a Heimatabend. The program's highlight was a ballet, "Die Puppenfee," ("The Fairy Doll") performed by the Kindergruppe of D'Lustigen Isartaler. Isartaler members had completed all the staging, scenery, and costumes. Everyone attending enjoyed this ballet which presented no age or language barrier to the audience. On Saturday evening a banquet was held at the Teutonia Männerchor Clubhouse, followed by Ehrentnze and music for everyone's dancing pleasure. Gifts were also presented commemorating D'Lustigen Isartaler's fifteenth anniversary. The Trachtenwallfahrt itself started early Sunday morning. The one-mile route from the Teutonia Clubhouse to St. Anthony's Chapel on Troy Hill was, for the most part, uphill. Along the way three shrines had been constructed and were beautifully decorated with wildflowers. The procession stopped at each shrine where prayers and religious passages were read. En route, the participants prayed the Rosary which reflected the solemnity of the Trachtenwallfahrt. The conclusion of the Wallfahrt was the Festgottesdienst at St. Anthony's Chapel. Father Arthur Hauser, O.F.M., was the celebrant with D'Lustigen Isartaler Chor in accompaniment. Following the Festgottesdienst everyone returned to the Teutonia Männerchor for an indoor/outdoor picnic. were accepted as member Vereine. This brings the total membership of the Gauverband to seventy-three Vereine. Several committee reports were presented and approved. They included raising the Gaufest assessment from $1 to $2 per banquet ticket sold and adding fourth- and fifth-place awards for Preisplatteln. Also approved was the creation of a flag committee to oversee the insurance needs of the flags of the Gauverband and member Vereine. Each Verein with a flag could have representation on this committee as well as contribute towards funding for catastrophic loss of a flag or flags. The bylaws committee was made a standing committee to review all bylaw changes and make recommendations for the delegates meeting. The twenty-fifth anniversary committee had recommended the publication of a Gauchronik which would provide a written and pictorial history of the Gauverband and its member Vereine. The delegates approved the recommendation, and publication was set for the latter part of 1991. The United German-Hungarian Schuhplattler Philadelphia and Alpenklang Troy presented requests to host the fifteenth general delegates meeting, and the delegates selected the Philadelphia area site for the 1992 meeting. D'Holzhacker Buam Milwaukee and Edelweiß Buffalo presented bids to host the 14. Gaufest. Their bids included audio-visual presentations as well as printed matter. Each Verein sponsored a Saturday evening reception. It was a spirited campaign by both Vereine, knowing that only one site would be selected---which turned out to be Buffalo, New York. At the thirteenth general delegates meeting in Pittsburgh, Pennsylvania, a new meeting format had been recommended. The change included seminars to expand on Bavarian and Tirolean culture. In years past the meeting consisted of general sessions with administrative and preisplatteln meetings to legislate operating procedures and preisplatteln rules for the Gauverband. Little time remained for workshops to study other areas of our Brauchtum The new format was a welcome change for most delegates. Seminars on Tracht, Jugend, customs, traditions, and ceremony, theater, Volkstanz, and music and song were developed by chairpersons with expertise in that area. The seminars were loosely structured to allow discussion among all in attendance, giving everyone an opportunity to learn as well as contribute personal knowledge. Each seminar was scheduled for one and one-half hours with two sessions conducted concurrently to give the Vereine an opportunity to have representation at each session. The results were gratifying for both leaders and participants. Future meetings will continue these seminars to learn about Bavarian and Tirolean culture. Reports for the 1989 and 1991 Gaufeste were presented by the respective chairpersons. The final report for the 12. Gaufest included a $1000 donation to the Gauverband for its youth activities. This generous donation was presented as a memorial for three members of the host Vereine. Executive board elections brought about only one change, the election of Erech Morrison of Maple Leaf-Almrausch Ottawa to Revisor. The meeting came to a close with the officers, delegates, and observers thanking the host Verein, Alpenrose Orlando, for its hospitality and labors for making the meeting possible. Many of the delegates stayed on to take in the sights and sounds of the Disney World resort area. More Celebrations, 1990 On July 5 through 8, 1990, Maple Leaf-Almrausch Ottawa held its Fahnenweihe. The Westin Hotel was the headquarters hotel for the weekend. Major Hill's Park was the center of activity for Friday evening's Heimatabend and for Sunday's picnic and farewell party. About one thousand Trachtler and Trachtlerinnen took part in the Fahnenweihe and represented thirty-three Gauverband member Vereine and one Verein from Germany, GTEV Almrausch from Frankfurt-am-Main. The Heimatabend had a unique program which included Alpine games. Visiting Vereine performed on an open-air stage and spectators were comfortably seated under tents. On Saturday the Royal Canadian Mounted Police and a brass band ushered the parading Vereine to the Basilica of Notre Dame for the flag blessing. Father Michalak and Monsignor Huneault were the celebrants, accompanied by the Schrammel Quartet and Jodler Trio. A trumpet solo paid tribute to deceased members with the playing of "Ich hatt einen Kameraden." After the church services the parade took everyone to Parliament Hill where the "Gauplattler" was performed, then back to the hotel for the banquet. The parade of flags and the national anthems opened the banquet ceremonies. Introductions and greetings by special guests were made after dinner. Ehrentnze by the host Verein and Almrausch Frankfurt were part of the evening program, as was music for everyone's dancing pleasure. On Sunday the picnic started by noon with Ehrentnze performed by visiting Vereine. Gifts and Fahnenbänder were exchanged in ceremony. Maple Leaf-Almrausch presented each visiting Verein with a Fahnennagel to commemorate the Fahnenweihe. Executive Board Meeting, 1991 Die Gemuetlichen Enzianer Maspeth was host to the executive board meeting on March 2 and 3, 1991, at the Verein's Almhaus in Lake Secor, New York. Lodging and meals for the officers were provided at the Almhaus. The meeting was held at the Mahopac Volunteer Fire Hall in nearby Mahopac. The officers arrived at the Almhaus on Friday, March 1, 1991, and were treated to food, refreshments, and an evening of socializing. The meeting was convened by 9:25 a.m. on Saturday, March 2, with a prayer by Gauschriftführer Walter Kraft. Michael Hubner, Hausmeister for Die Gemuetlichen Enzianer, greeted and welcomed the officers to Lake Secor, thanking them for the opportunity to host this meeting. The first business at hand was reading and approving officer reports. The Gaufest steering committee presented several recommendations to help Vereine host future Gaufeste. The Heimatabend was the latest addition to the Gaufest schedule and afforded the opportunity to present all elements of Trachtenleben such as music, song, folklore, theater, and Volkstänze. The committee set up guidelines to allow it to become more involved in the Gaufest bid process and mandated pre- and post-Gaufest reporting. The steering committee would be the overseer of future Gaufeste with the hopes of stimulating Vereine's interests in hosting a Gaufest. A handbook was in the making to help Vereine with Gaufest scheduling and details. The steering committee's experiences with previous Gaufeste would be helpful in guiding and supporting Vereine to host a Gaufest. Another area of concern was the success of the upcoming 13. Gaufest in Vancouver, British Columbia. High hotel and travel costs were discouraging many Vereine from attending. This was a big letdown for the members of host Almrausch, especially considering the earlier positive responses. The host had exhausted all its energies to bring these costs down. The Gauverband officers, realizing the host's predicament, drafted a resolution to encourage Vereine to participate in the 13. Gaufest with Fahnenweihe and to celebrate the twenty-fifth anniversary of Gauverband Nordamerika. The resolution also urged the Vereine to live up to the commitment they made at the general delegates meeting in Pittsburgh on May 1, 1988, when they voted on the site of the 13. Gaufest.The resolution was sent to each member Verein, and it was also included in the April issue of the "Gauzeitung" with the hope of reaching as many Trachtlerinnen and Trachtler as possible. The flag committee finalized guidelines that it would present to the delegates. This arm of the Gauverband will provide coverage to replace the accidentally damaged or destroyed Fahnen of participating Vereine. Progress on the Gauchronik was reported to be on schedule. The preisplatteln judges panel was expanded to seventeen members and further expansion was recommended. Meistpreis trophy guidelines were presented for inclusion in the Gaufest Operating Rules. The office of Musikwart was proposed and would be charged with stimulating and encouraging the preservation of Alpine music, song, and musical instruments among member Vereine. Teaching workshops would be included at a Gaufest and/or general delegates meeting. Gaubeisitzer Leo Mayer was congratulated on receiving the Silbernadel from the Heimat- und Trachtenvereinigung Huosigau, a Gauverband to which his Verein belongs. Erech Morrison, Gaurevisor, reported on Maple Leaf-Almrausch's Fahnenweihe in Ottawa and proudly turned over Almrausch's $500 donation to the Gauverband for the benefit of the Jugend. Before the conclusion of the meeting on Sunday morning, the executive board praised the members of Die Gemuetlichen Enzianer for their hospitality, the meeting facilities, and the Almhaus, all of which contributed to making this meeting and the officers' stay a very productive and harmonious weekend. Celebrations, 1991 On April 19 through 21, 1991, Germania Almrausch Poughkeepsie celebrated its 21. Stiftungsfest with Fahnenweihe. The Poughkeepsie Radisson Hotel and the Mid-Hudson Civic Center were headquarters for lodging and banquet celebration. About 550 guests converged on the Radisson Hotel that weekend, representing 20 Vereine from the Gauverband. A welcome dance was held on Friday evening at the Germania Hall where food and refreshment were served. Several Ehrentnze were performed and dance music entertained everyone. On Saturday, April 20, the Vereine proceeded to Our Lady of Mount Carmel Roman Catholic Church for the flag blessing. Edelweiß-Passaic, the Patenverein, led the procession into the church at 11:30 a.m. with the host Verein entering last in traditional form. The Reverend Richard LaMorte, past of O.L.M.C., was the celebrant, and Reverend Henry Wuerz, Pastor of First Evangelical Lutheran Church, shared in the flag blessing ceremonies. Following the church services a parade guided all the Vereine to the Poughkeepsie Main Mall where the "Gauplattler" was performed. On Saturday evening the banquet brought everyone together in the Mid-Hudson Civic Center, where a parade of flags opened the evening's program. Several guests were introduced after dinner, and Ehrentnze and dance music followed. Gift and Fahnenbänder presentations were made that evening to complete the formal ceremonies of the weekend. On Sunday morning a brunch and farewell dance were held at the Radisson Hotel, bringing this festive weekend to a close. 13. Gaufest, Vancouver, 1991 The city of Vancouver, British Columbia, was the next site for Trachtler and Trachtlerinnen to assemble for a Gaufest. July 4 through 7, 1991, was the weekend selected, and Almrausch Vancouver was host to the 13. Gaufest with Fahnenweihe. On July 4 Almrausch members welcomed the Trachtlerinnen and Trachtler of the Gauverband Vereine at the registration booth of the Hyatt Regency Hotel. Registration as well as souvenir booths were open to greet the arriving participants. About 750 Trachtlerinnen and Trachtler attended this Gaufest representing 46 Trachtenvereine including three from Germany, namely, HTV D'Würmtaler Menzing; GTV Edelweiß Stamm Hamburg; and Trachtenverein Heroldsberg. All the events of the Gaufest included the music of two Bavarian Trachtenkapellen, one from Lenting and one from Büchlberg. On Thursday evening a welcoming dance was held at the Hyatt Ballroom where Blaskapellen alternated playing for everyone's dancing pleasure. In between open dancing, Vereine performed Ehrentnze, and everyone had the opportunity to renew acquaintances and make new friends during the evening. On Friday, July 5, dance workshops were held starting at 10 a.m. demonstrating the "Kronentanz" and the "Laubentanz." In the afternoon two workshops covering Tracht and Volkstanz for youth were held. A presidents and Vorplattler meeting followed by a Fahnenträger meeting were held to review the weekend's events, select the five preisplatteln judges, and determine preisplatteln positions and dance selection. Later that evening a Heimatabend was held at the Hyatt Regency Ballroom. The evening's program was more formal, and performances by various Vereine were scheduled throughout the evening. Both Blaskapellen played in between performances, giving the evening a culturally balanced and enjoyable program. Saturday morning brought everyone out of their rooms for Preisplatteln which started at 10 a.m. Practice rooms were open at 9:30 a.m. with group picture-taking prior to competition. Out of forty Vereine represented, only eleven Vereine participated in Preisplatteln. As in the past, each dance group showed its best and created excitement and anxiety for participants and spectators. Before the banquet, about one hundred guests attended a VIP reception given by the host Verein. The banquet was held at the Vancouver Trade and Convention Centre located at the waterfront not far from the hotel. The Trachtlerinnen and Trachtler enjoyed the short walk to the Centre, taking in the splendid scenery and noting the cleanliness of the city. The local inhabitants and tourists were impressed with the Tracht that was displayed at this time. The banquet hall opened at 5:30 p.m., and the parade of flags initiated the evening's program followed by the national anthems of Austria, Germany, the United States, and Canada. After dinner, guests were introduced and Ehrentnze were performed. Dance music performed by the two Blaskapellen completed the evening's program. Almrausch made courtesy rooms available for parties at the hotel after the banquet. This gave guests time for additional social interchange, music, and dancing into the early morning hours. On Sunday Almrausch sponsored a Fahnenweihe at the Vancouver Trade and Convention Centre. A parade from the Hyatt Regency commenced at 10 a.m. bringing everyone to the Centre for a Catholic mass with a flag blessing ceremony. The celebrant Father Burkhart and a Kirchenchor were from a German Roman Catholic Church in Vancouver, and Trachtenkapelle Lenting provided musical accompaniment. The ceremony was held in true Bavarian tradition and spirit with HTV D'Wrmtaler Menzing as Patenverein and about eight hundred watchful participants on hand. Afterwards, Almrausch paraded to an adjacent hall within the Centre for the afternoon picnic. The festivities were again opened with a parade of flags and the national anthems. Several introductions were made and a greeting from Bavarian Ministerpräsident Dr. h.c. Max Streibl was made through Horst Amenda, Stadtrat of Ingstadt an der Donau, who was at the Gaufest the entire weekend. Fahnenbänder and gift exchanges preceded the awarding of prizes. Anxiety was building among the Trachtlerinnen and Trachtler to know the preisplatteln winners. Die Gemuetlichen Enzianer Maspeth received the Meistpreis, and the Original Auerhahn Schuhplattler Miami won the Weitpreis. For the first time, preisplattlen awards were made to five participating Vereine, namely: 5. Preis: Maple Leaf-Almrausch Ottawa, 4. Preis: Bavaria Cleveland, 3. Preis: Die Gemuetlichen Enzianer Maspeth, 2. Preis: Bayern Verein Newark,1. Preis: Edelweiß Denver. Each of the prize winners performed its winning dance and then proudly accepted its award. By late afternoon the festival hall started to empty, and the attendants returned to the hotel to prepare for their vacations, cruises, and the farewell party that evening. This final get-together meant that the Gaufest was coming to a close, which saddened many of the Trachtlerinnen and Trachtler who would return to their home cities with fond memories of a wonderful Gaufest. The farewell party gave Almrausch Vancouver's members a chance to enjoy the final episode of the 13. Gaufest and the opportunity to say farewell to their friends who had come from near and far. Delegates Meeting, Philadelphia, 1992 In the Gauverband's twenty-sixth year, the delegates meeting was hosted by The United German-Hungarian Schuhplattler Group of Philadelphia and Vicinity at its Vereinsheim in Oakford, Pennsylvania. The meeting, on May 4 and 5, was attended by 166 Trachtler and Trachtlerinnen representing 49 member Vereine and five potential members. Workshops were held on Tracht, Mundart, music, dance--with an emphasis on Volkstanzen--and Jugend. These workshops are enthusiastically presented and received and strengthen the Gauverband's depth. The Preisplatteln meeting yielded a major change: All seven judges will judge Preisplatteln at the next Gaufest. Alpen Schuhplattler- und Trachtenverein Pittsburgh will host the 1994 delegates meeting. The delegates chose Milwaukee as the site of the 1995 Gaufest, with D'Holzhacker Buam Milwaukee and D'Werdenfelser Sheboygan as joint hosts. When elections were held, the board members stayed intact, with only shifts in positions. Martin Hubner and Tom Vogt became 1. and 2. Vorplattler respectively, and Don Klingseisen was elected Revisor. Walter Wieand appointed Dan Biehler to the newly created position of Musikwart. Board Meeting 1993  Milwaukee? The Future The Gauverband is indebted to the founders of our Vereine who had the desire to keep Bavarian and Tirolean culture alive in their newfound homeland. They built their Vereine on a foundation of pride in upholding the traditions of their Heimat. In 1966 we built on that foundation by forming a federation of Schuhplattler- und Trachtenvereine now called "Gauverband Nordamerika," and the federation continues to thrive. Special events such as silver and golden anniversaries, Fahnenweihen, and Gaufeste have brought the member Vereine of Gauverband Nordamerika together on a regular basis. All of these events were special in their own way, and everyone attending enjoyed them differently. Celebrations of many kinds will be held in future years and will surely enrich the Gauverband. The past quarter century has been bountiful for the Gauverband and its member Vereine in more ways than we may realize. Our Bavarian and Tirolean culture of Tracht, music, and dance brought us all together; friendships flourished, and we are richer for it. No one can ever take this from us. We must now look to the future and instill these traditions in our youth so that they will continue what we have started.